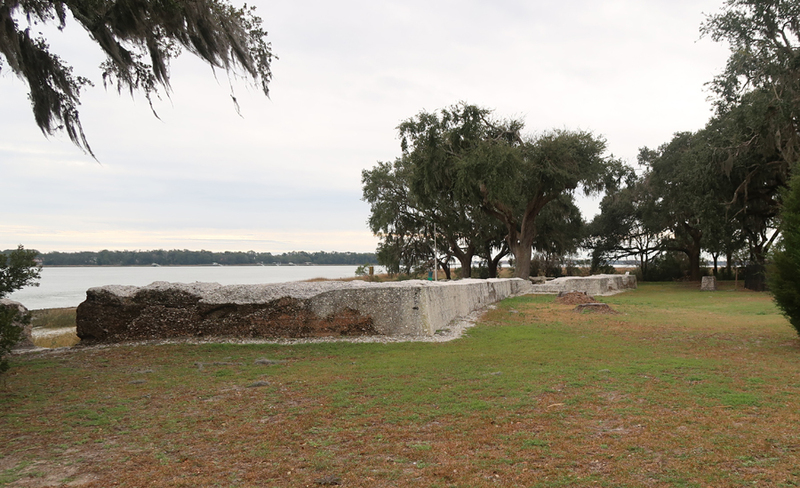 Tabby is a type of concrete made by burning oyster shells to create lime, and then mixing it with water, sand, ash, and broken oyster shells. 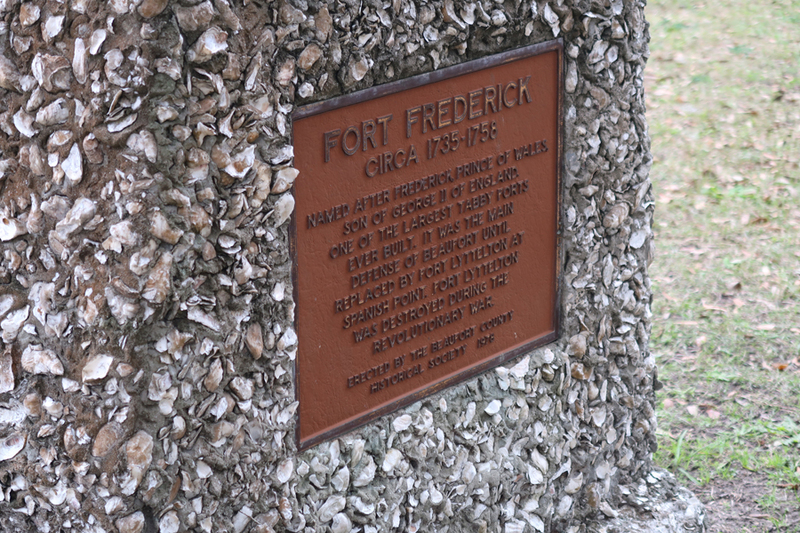 Fort Frederick is on the National Register of Historic Places. 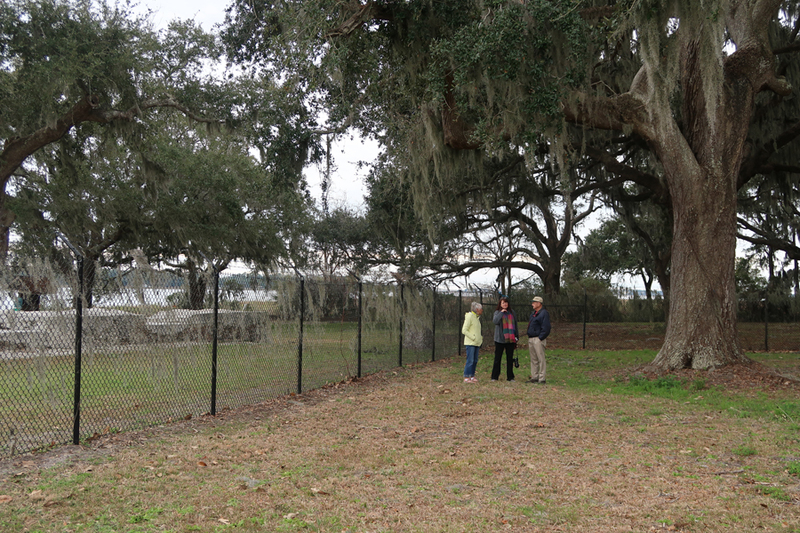 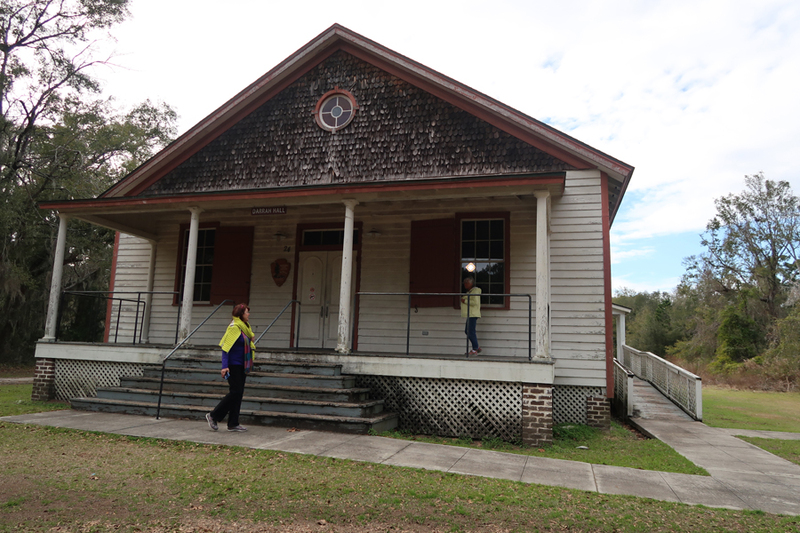 Our next stop was downtown Beaufort and the Old Beaufort Firehouse, which will become the Visitor Center for Reconstruction Era National Monument. 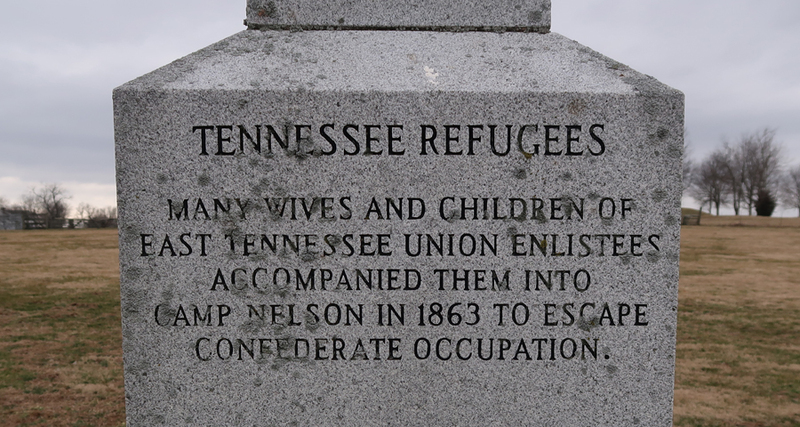 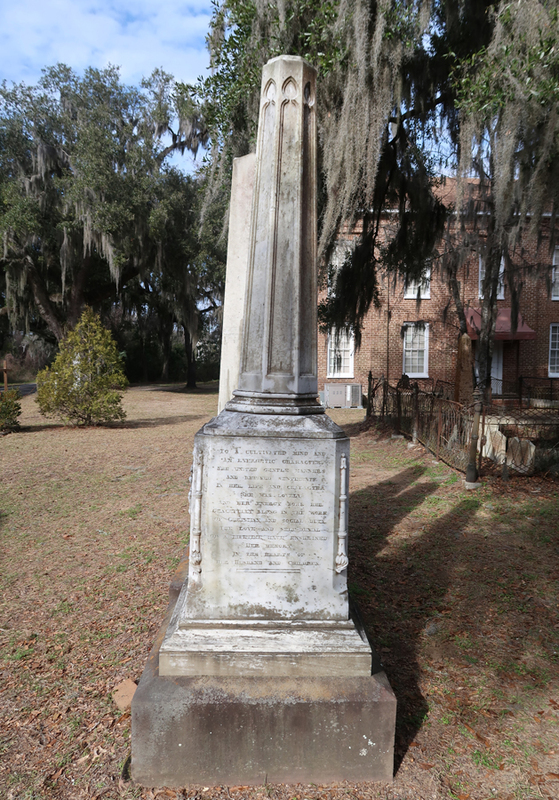 According to the NPS, the Reconstruction Era, as represented in this monument, was 1861-1898. 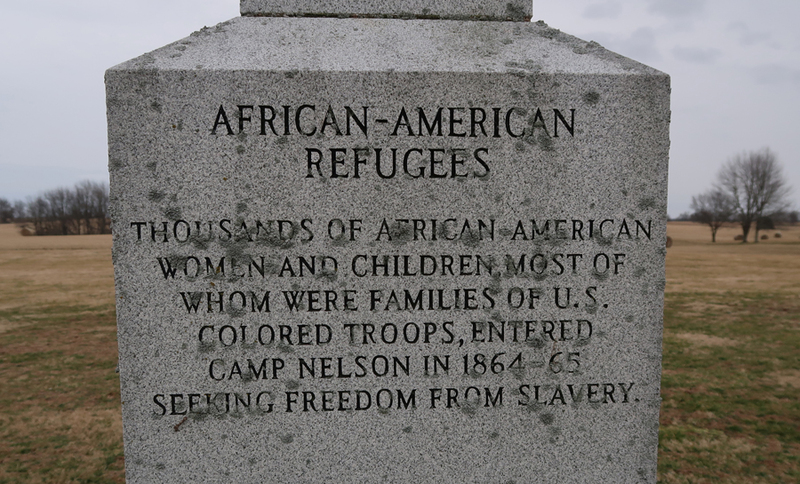 The period when the U.S. grappled with how to integrate millions of newly freed African Americans into social, political, economic, and labor systems. 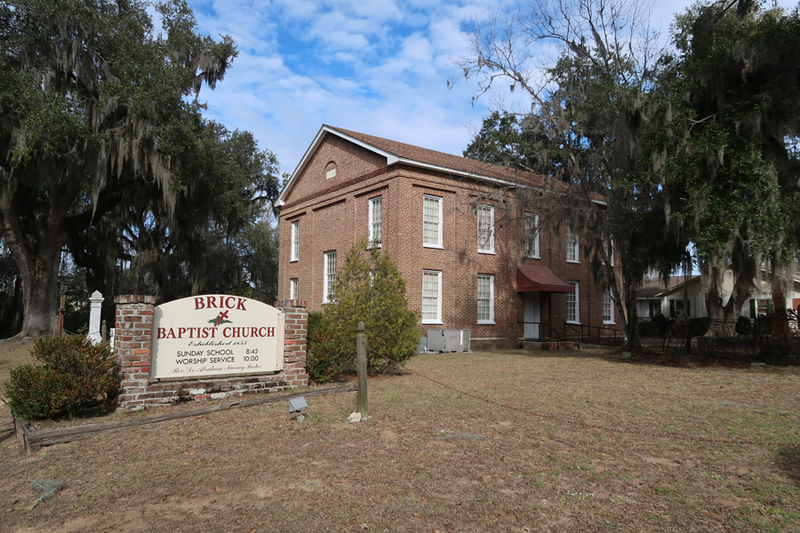 The people, places, and events in Beaufort County, SC, reflect on the most important issues of this tumultuous time period. 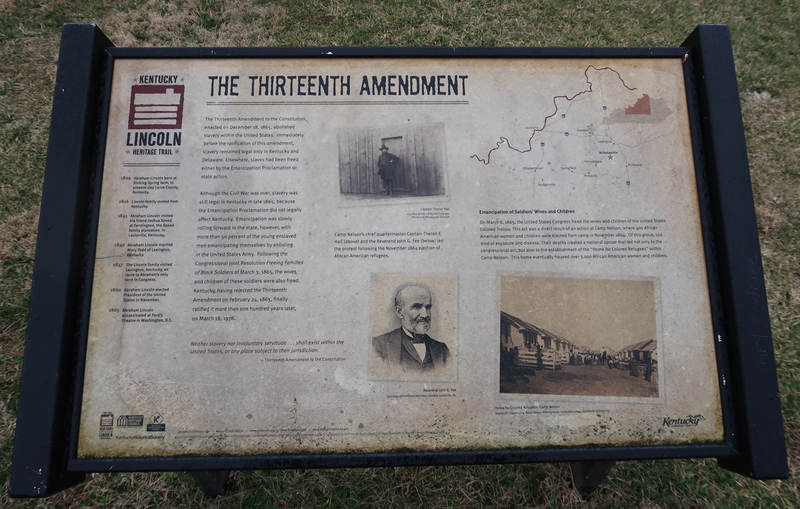 Abraham Lincoln started planning for the reconstruction of the South during the Civil War as Union soldiers occupied huge areas of the South. 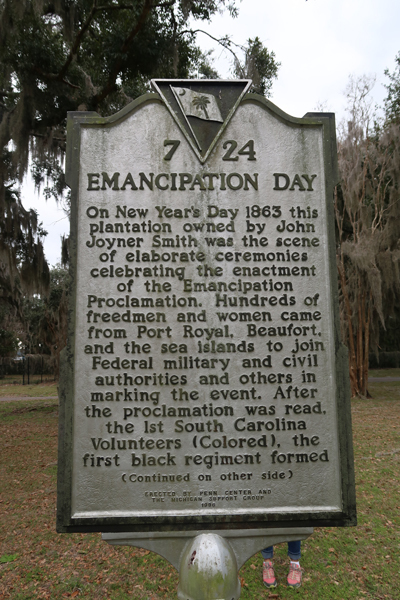 According to Wikipedia, there were three visions for Reconstruction: the reconciliation vision, which was rooted in coping with the death and devastation the war had brought; the white supremacist vision, which included terror and violence; and the emancipationist vision, which sought full freedom, citizenship, and Constitutional equality for African Americans. 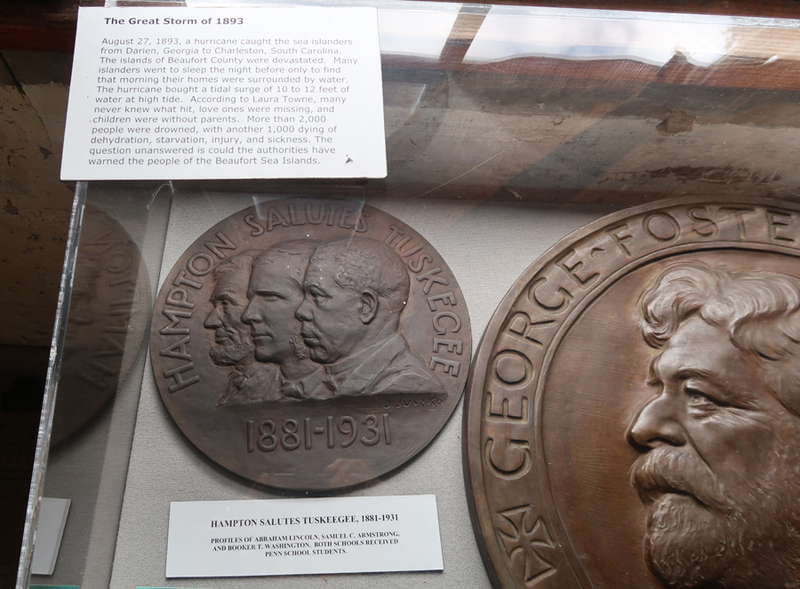 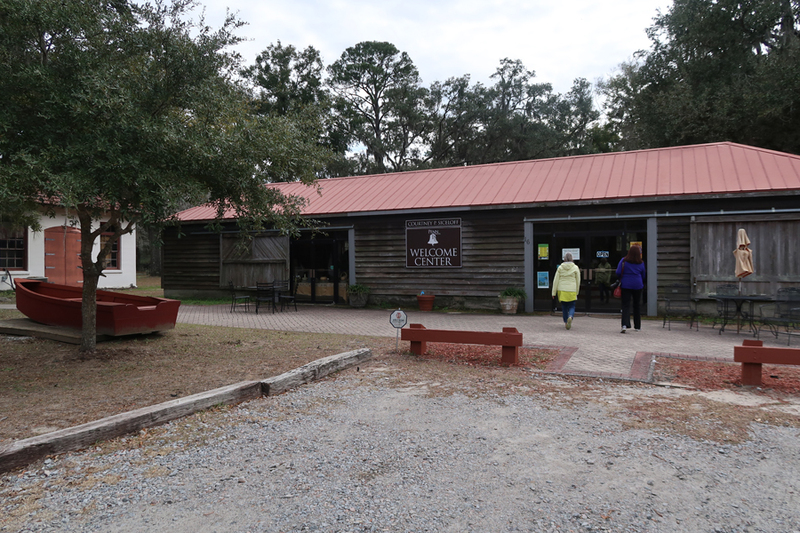 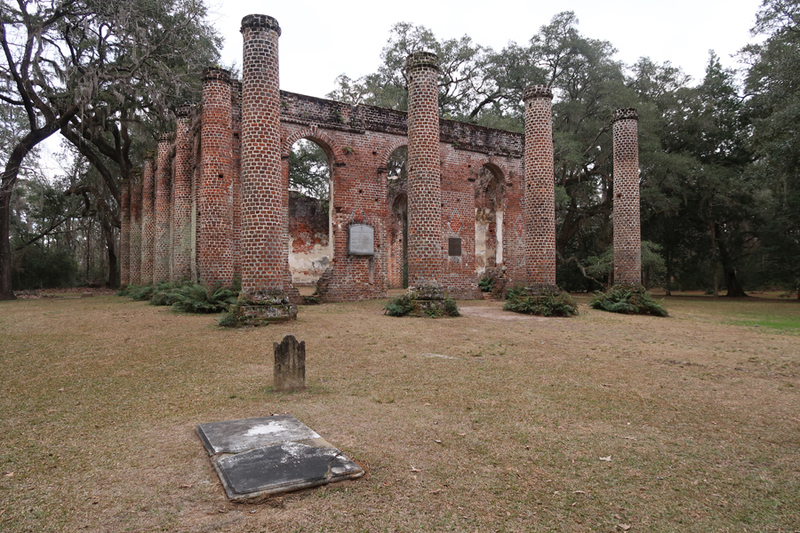 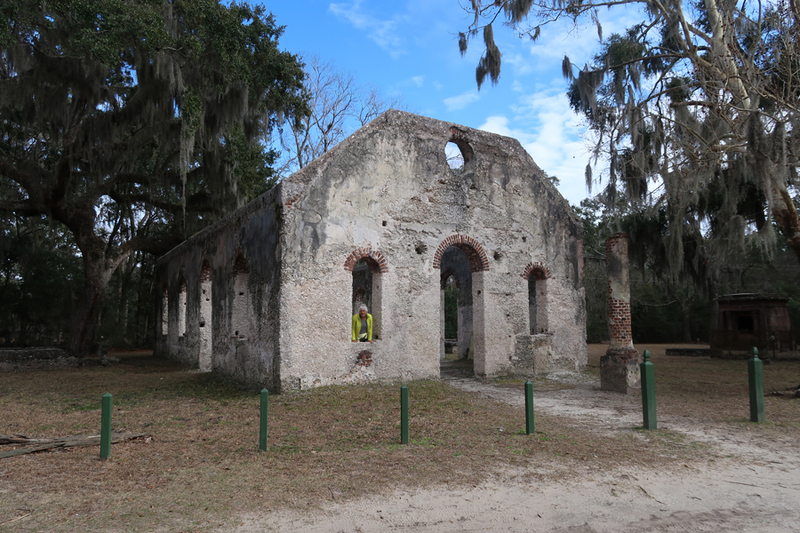 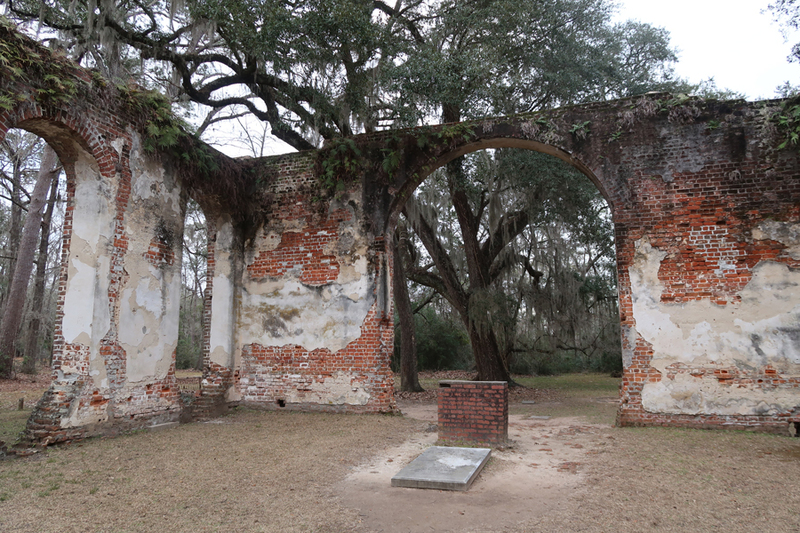 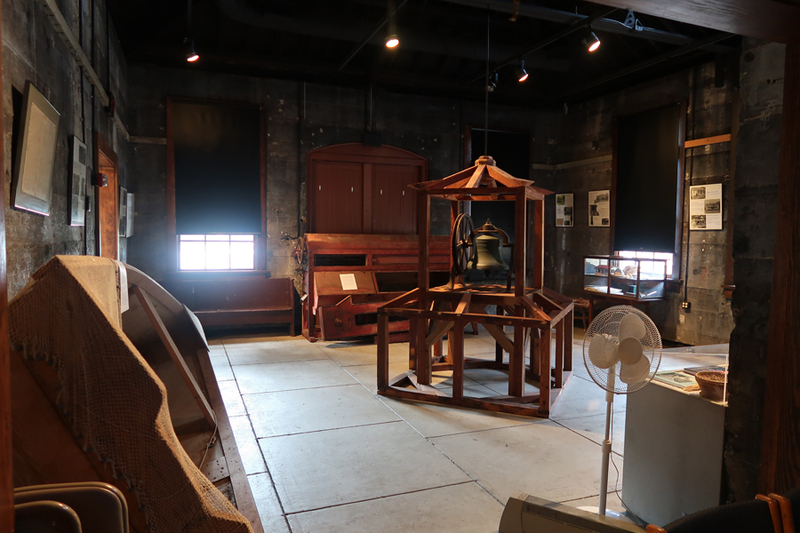 We then drove to St Helena Island and the Penn Center National Historic Landmark District, Darrah Hall and the Brick Baptist Church are located here and are both part of the Reconstruction Era National Monument. 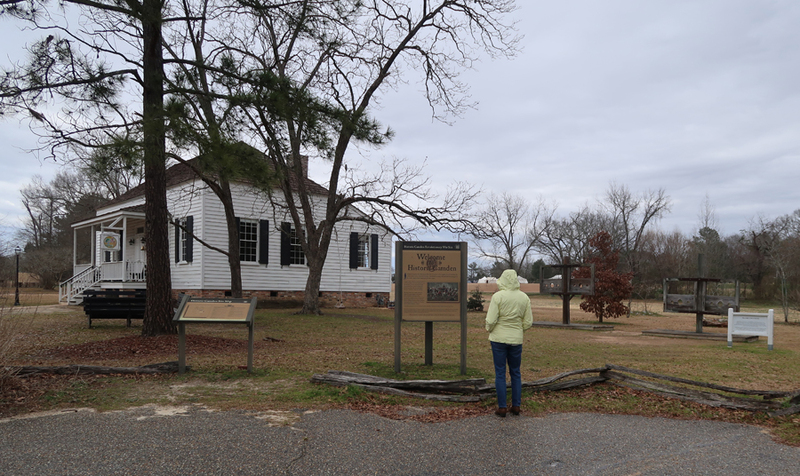 We then walked to Darrah Hall. 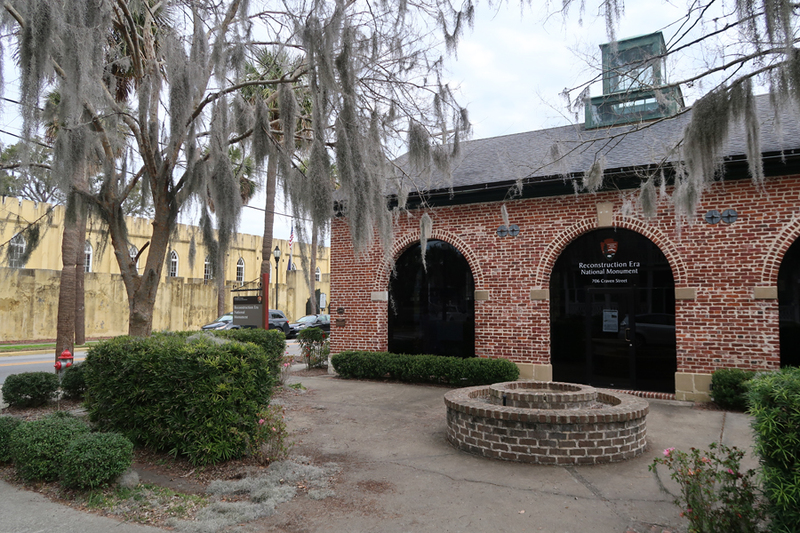 The original was built in 1882 but burned in 1893 after “The Great Hurricane.” This building was constructed in 1903 and is the oldest building on campus. 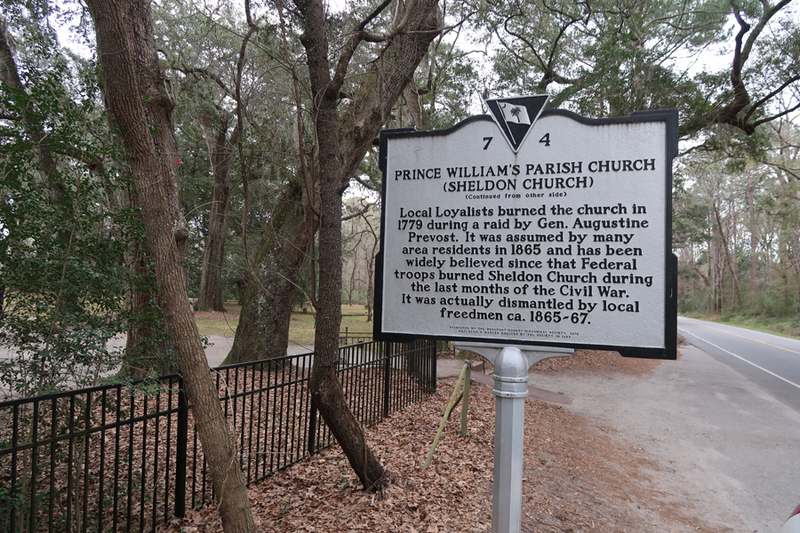 Sign along Martin Luther King Highway (Rt 45). 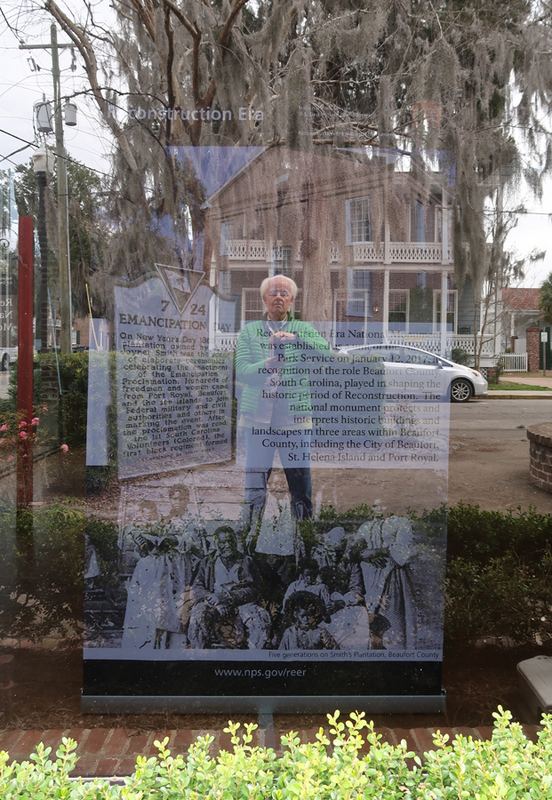 MLK stayed at the Gantt Cottage on campus in the 1960s. 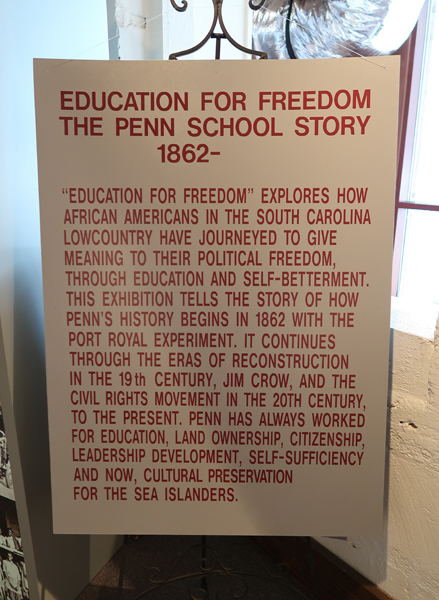 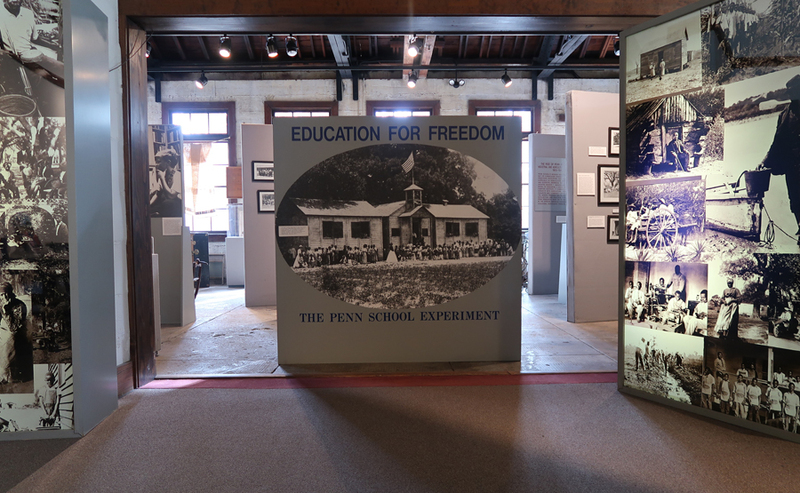 The Penn Center was one of the few places in the South where bi-racial groups could meet. 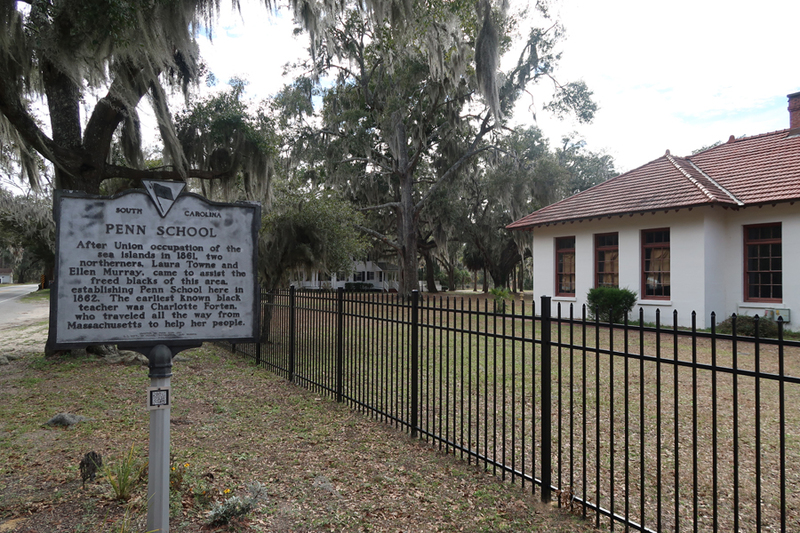 The first school for freed slaves in the South was established here in 1862. 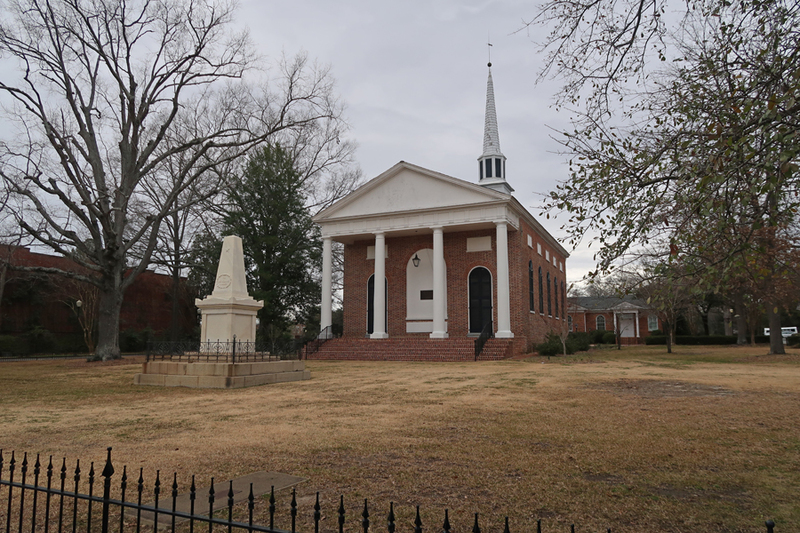 Classes were first held in the Brick Church, which was built by slaves in 1855 and is now part of the Reconstruction Era National Monument. 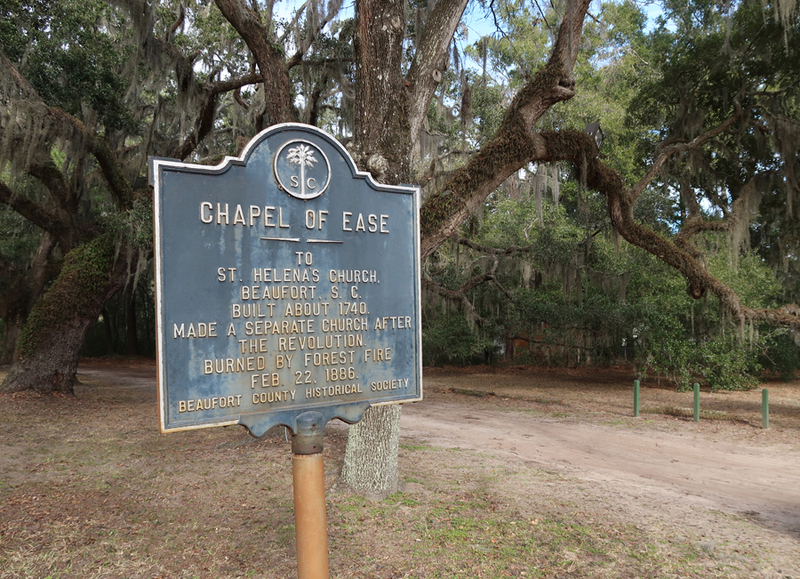 Just down the road from the Penn Center is the Chapel of Ease – built around 1740, before the Revolutionary War! 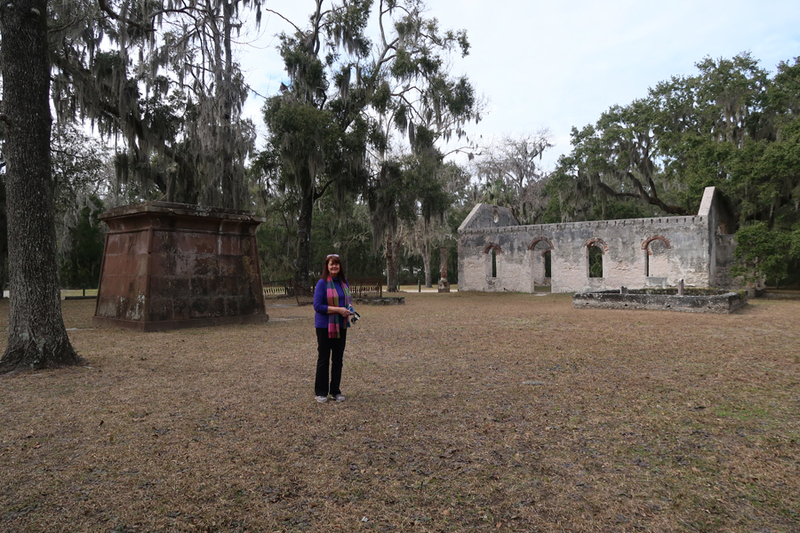 We then drove about 25 miles NE to the scenic Old Sheldon Church Ruins. 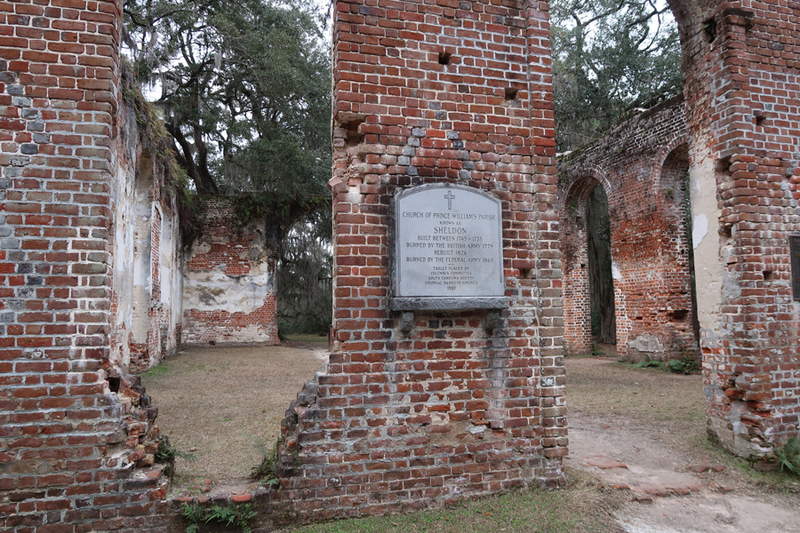 This Episcopal Church was also built before the Revolutionary War (1751-57). 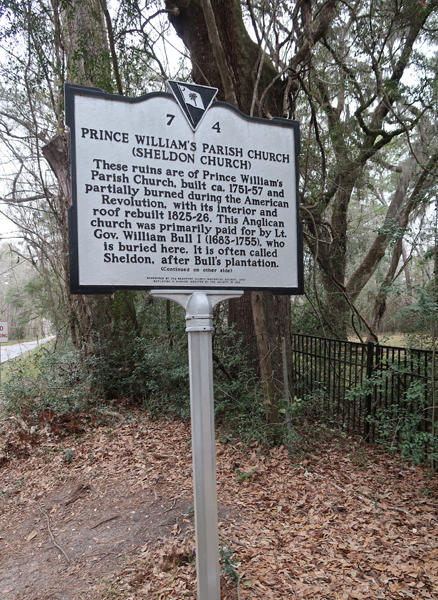 It was named Sheldon after Gov. 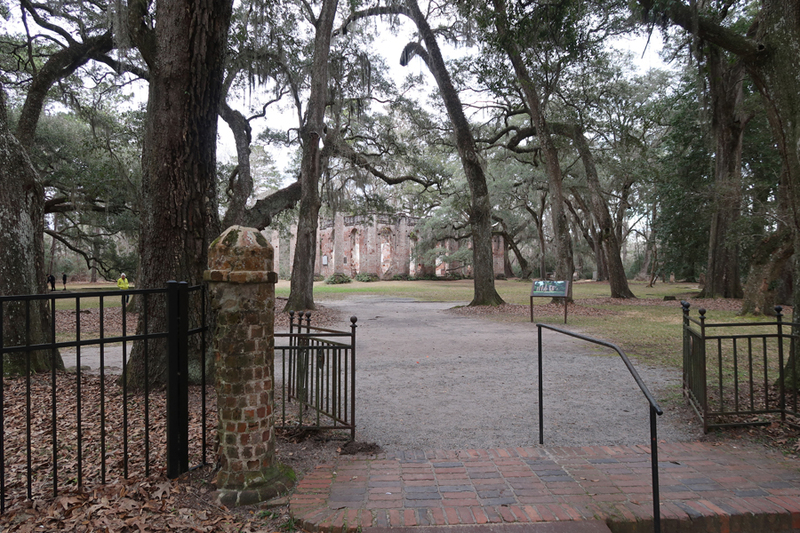 William Bull I’s plantation, as he paid for most of the construction. 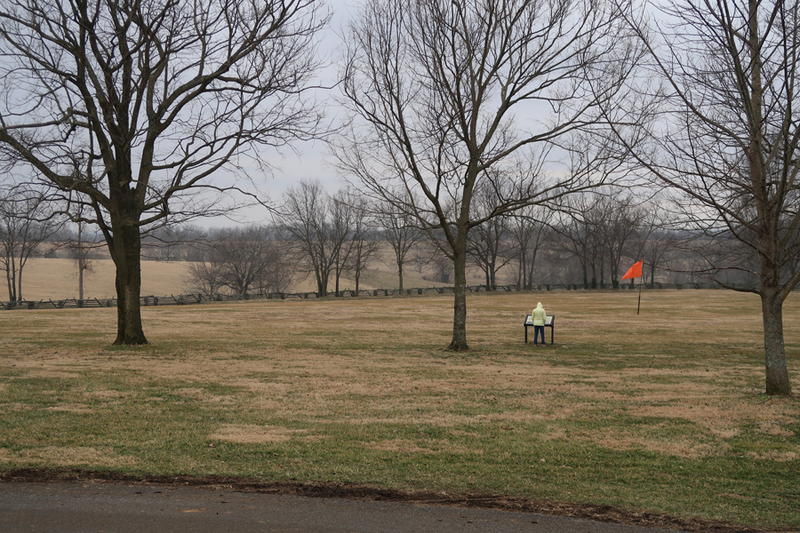 Guess what was waiting at Karen’s? 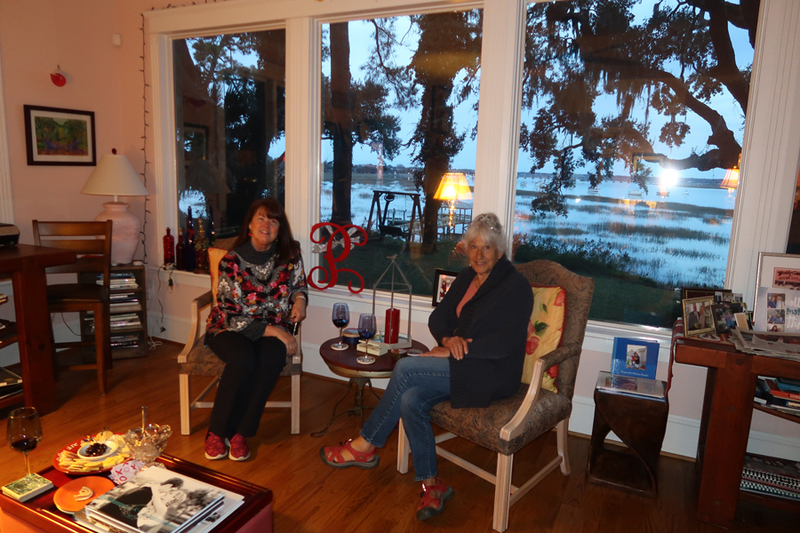 A “Crab” dinner! 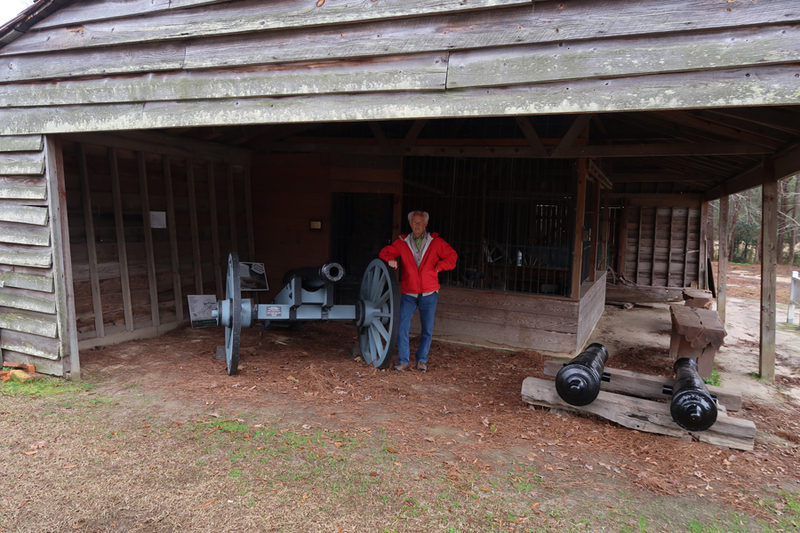 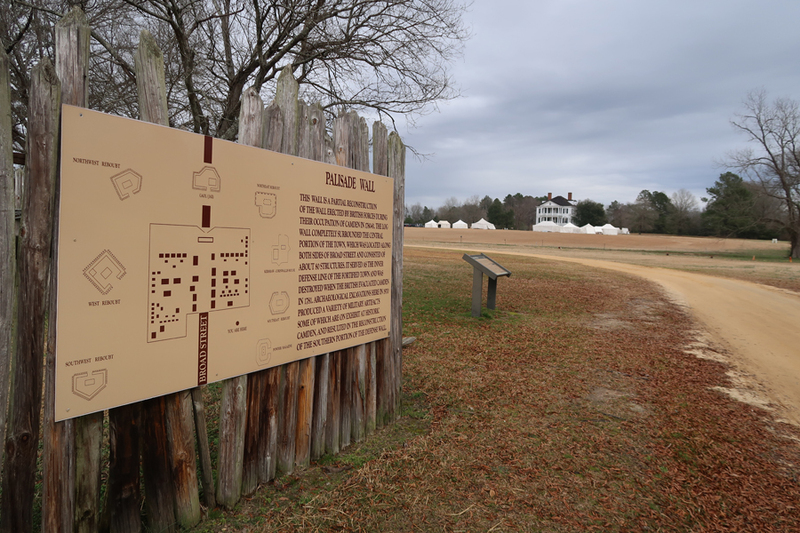 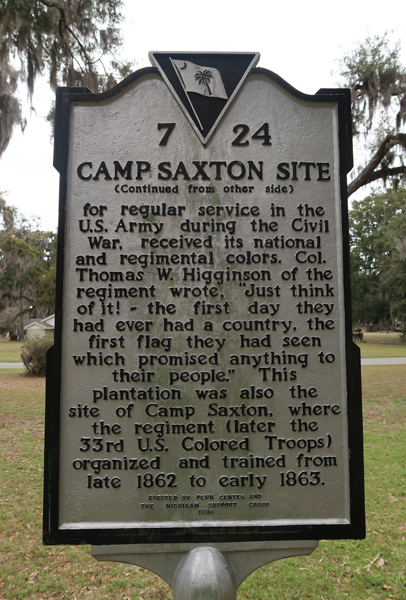 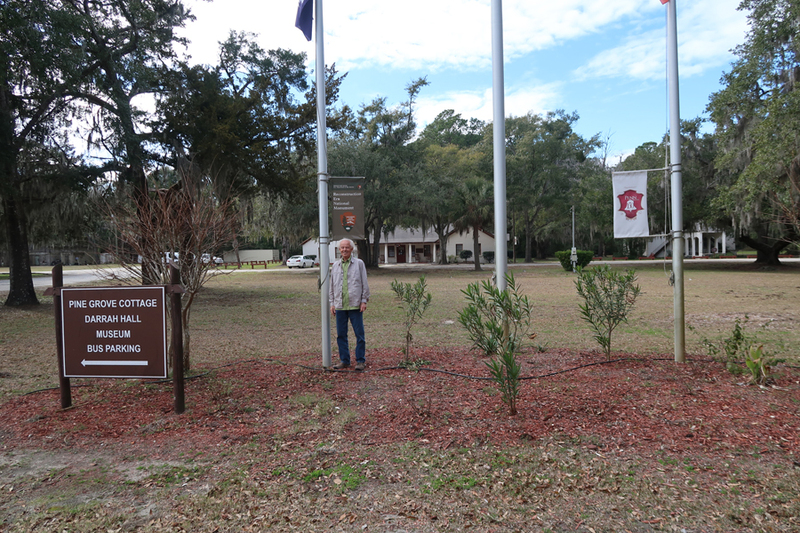 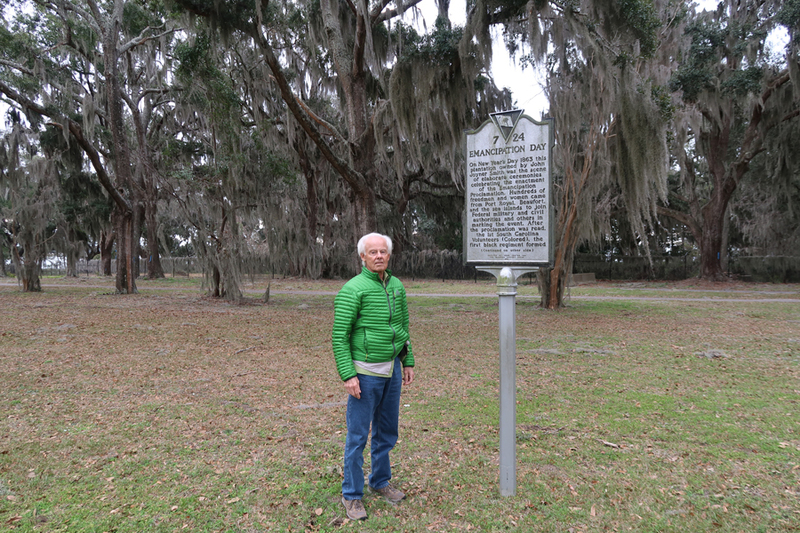 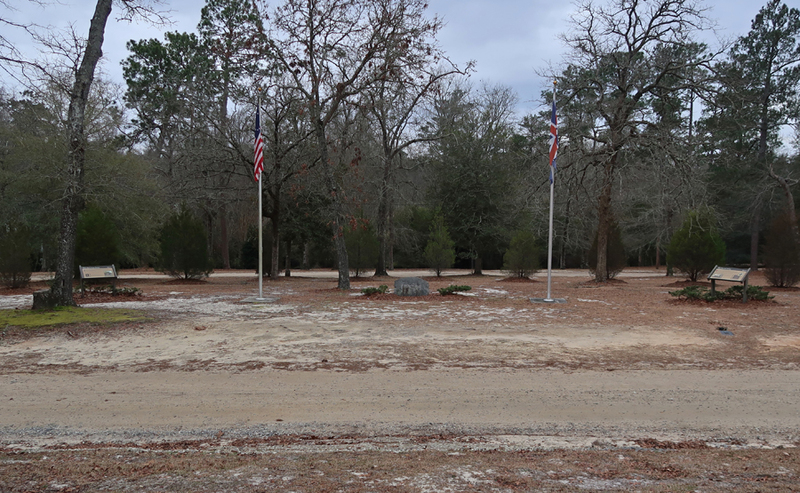 2/3 Sun – It was a 3hr drive to Historic Camden, a SC Revolutionary War Site which is an Affiliated National Park Unit. 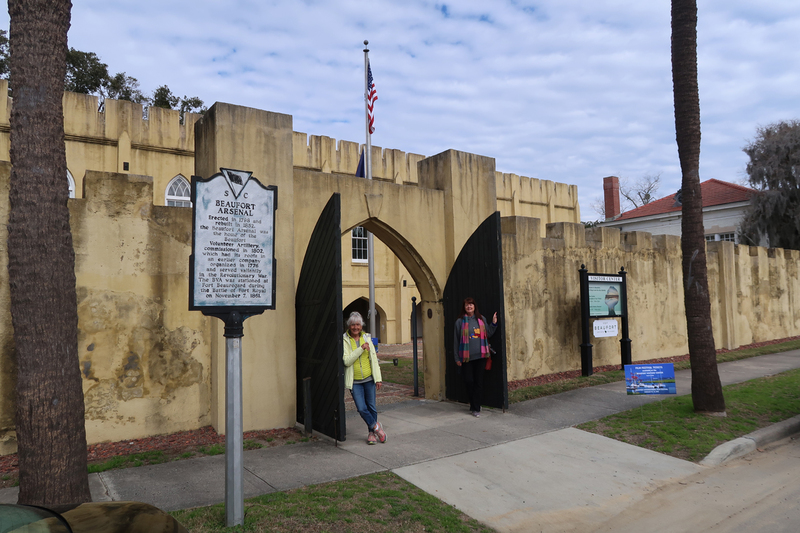 This fortified town was occupied by British General Cornwallis’ men from 1780-81. 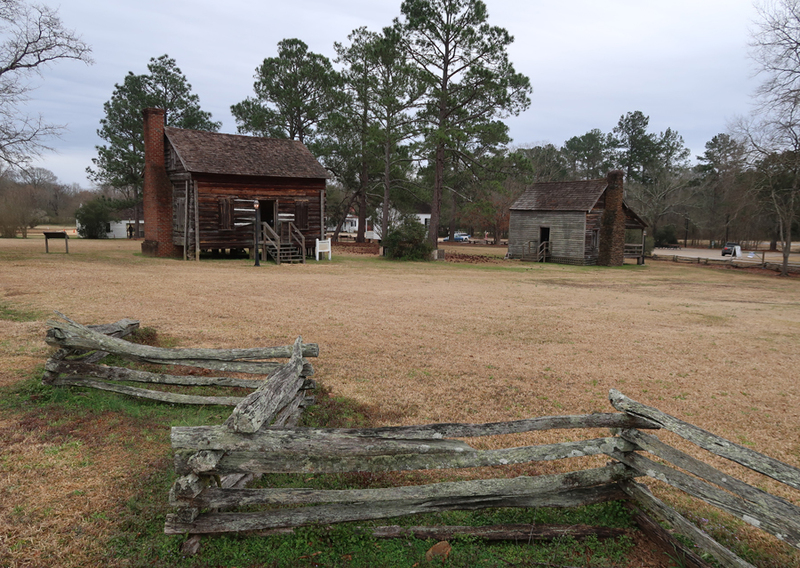 In 1780, Camden was the oldest and largest city in the Carolina backcountry. 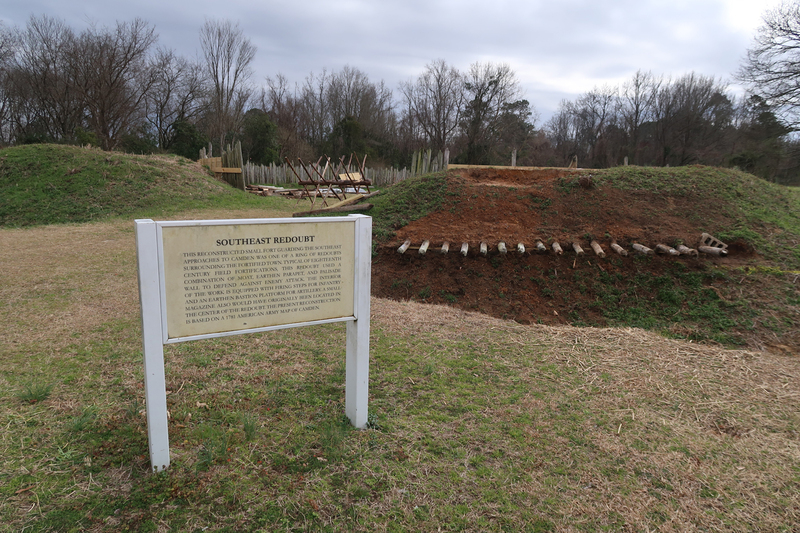 Cornwallis built a palisade wall and six redoubts to protect the town site. 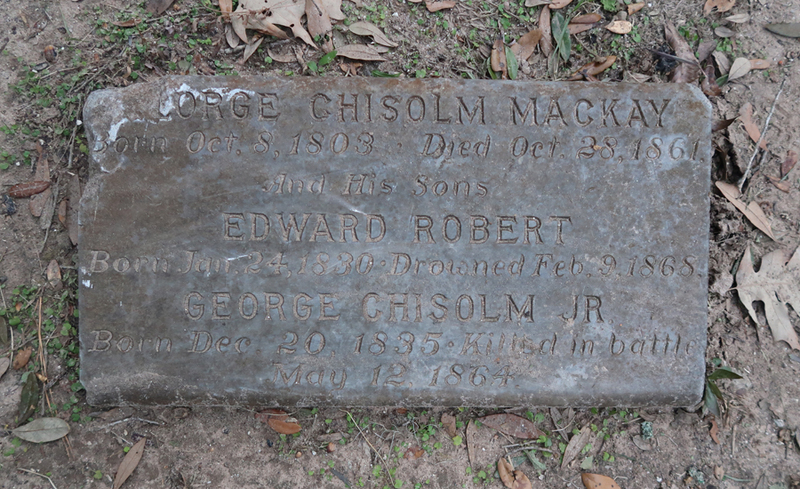 He also took over the Kershaw house just east of town as his headquarters. 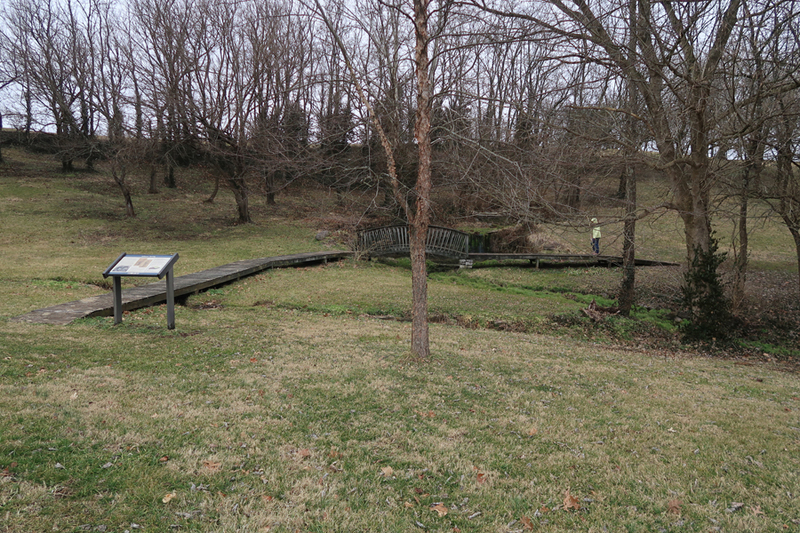 It can be seen in the distance. 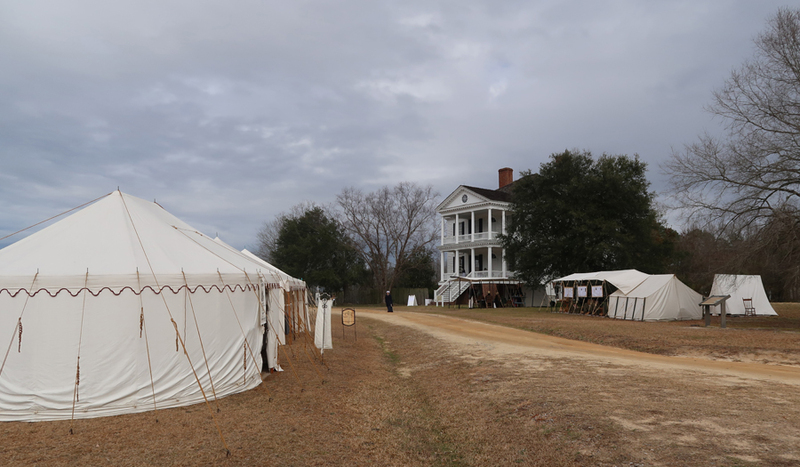 The tents, etc. 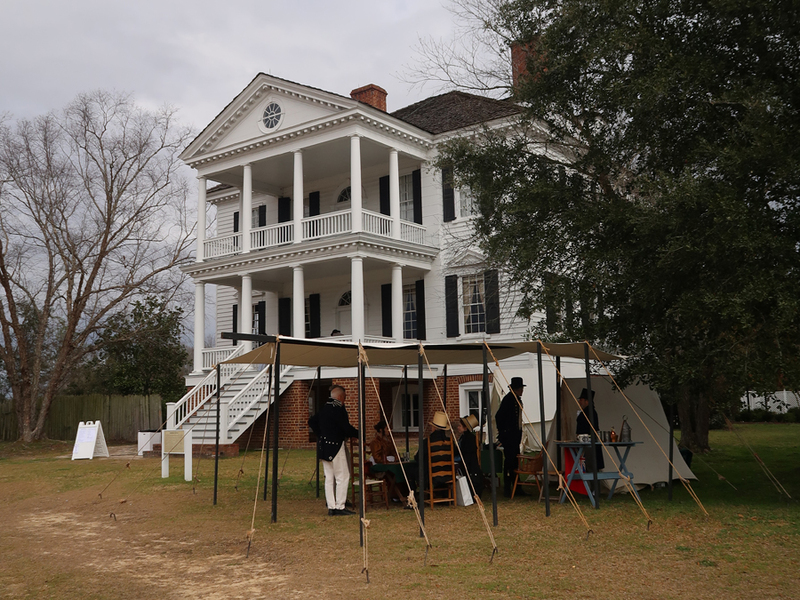 when we visited were related to a reenactment of the Treaty of Ghent. 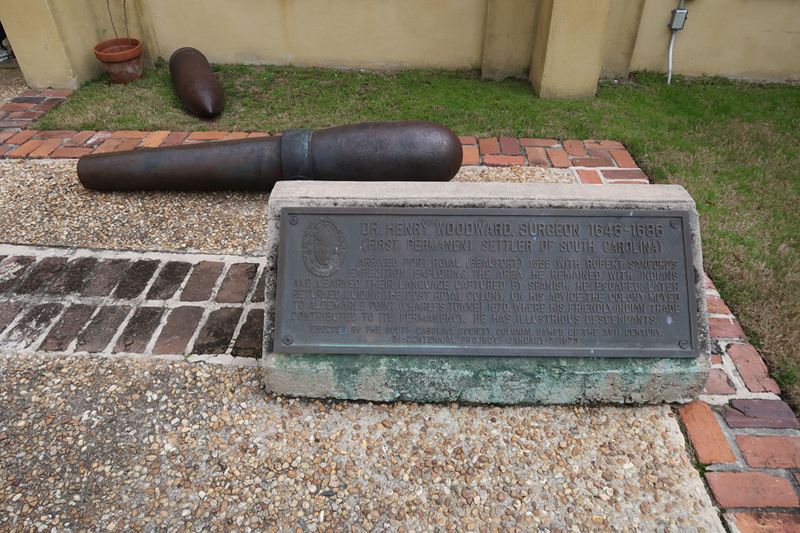 It was signed in Ghent Netherlands on December 24, 1814 ending the War of 1812 between the US and Great Britain. 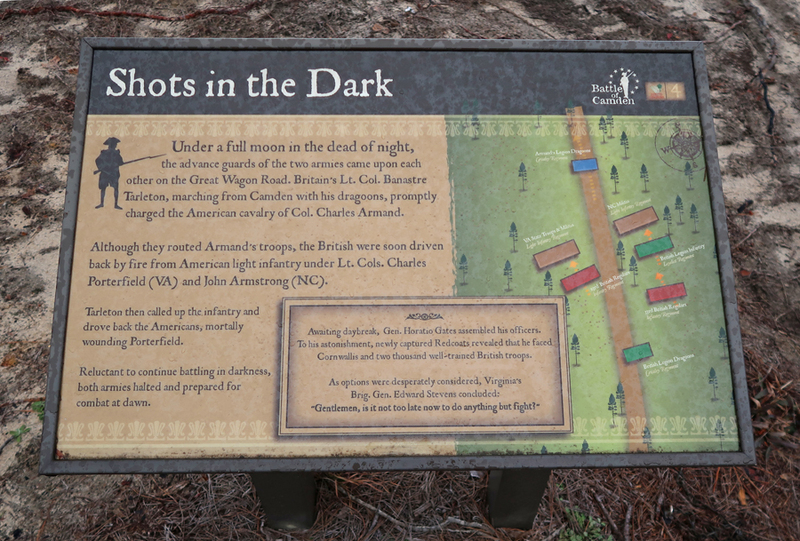 It took a month for the news to reach the US, during which American forces under Andrew Jackson won the Battle of New Orleans (1/8/1815). 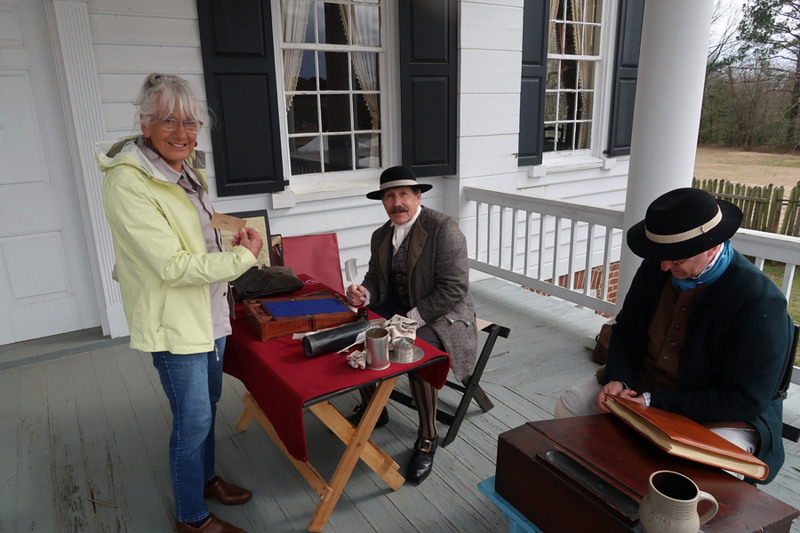 Scribes – when letters/documents were written! 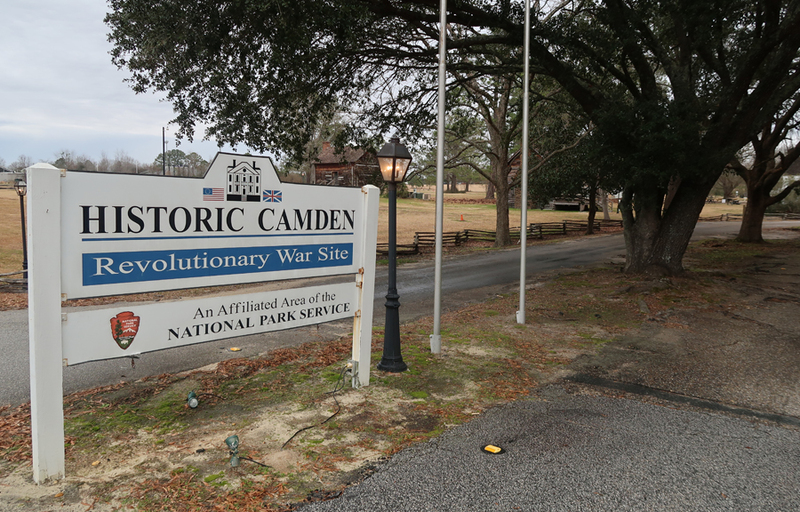 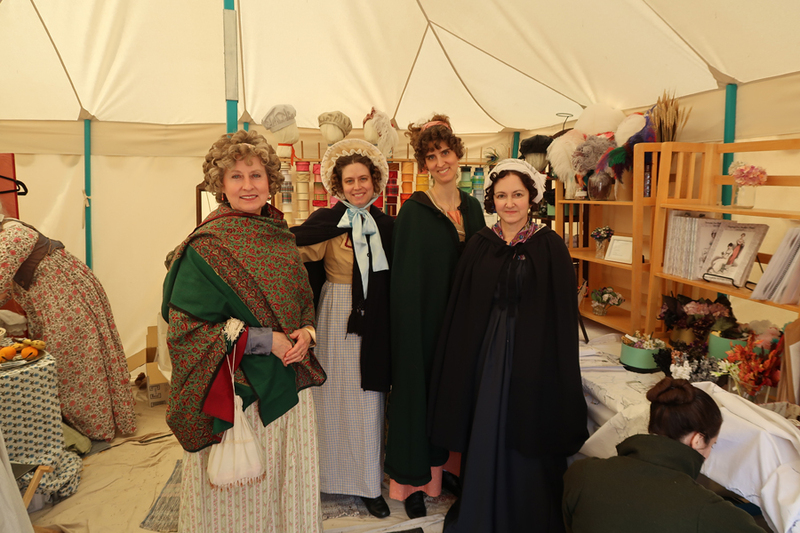 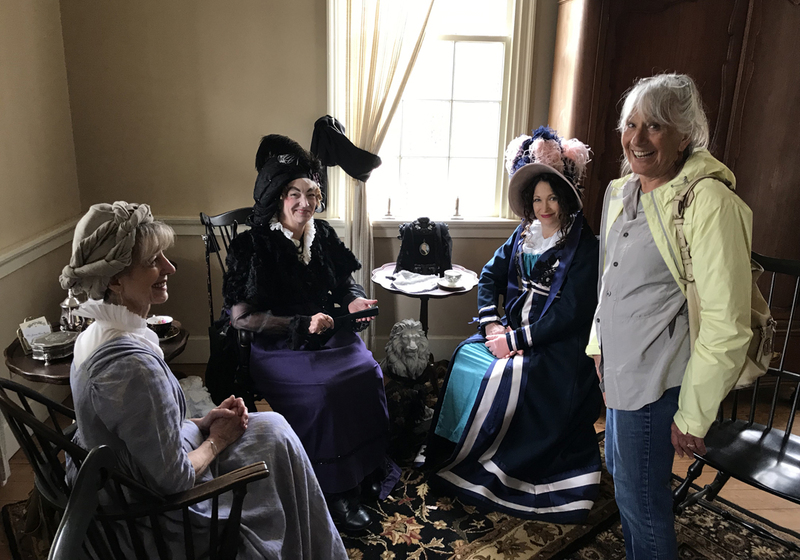 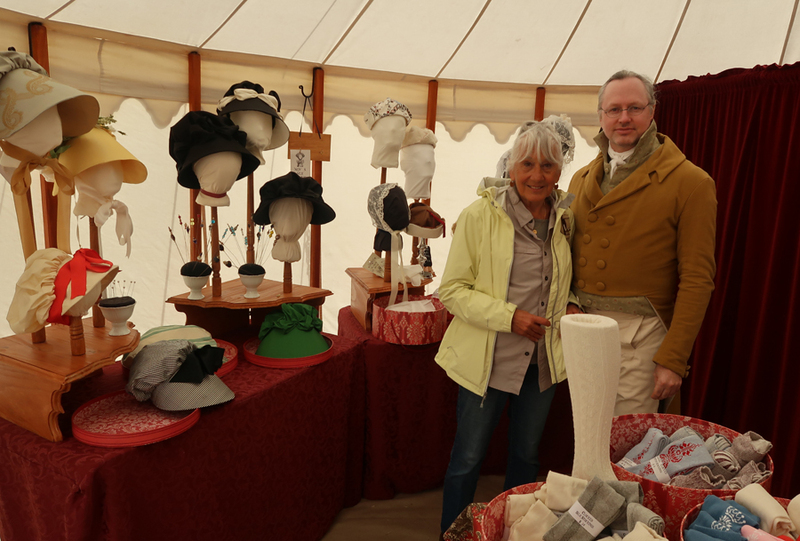 The Treaty reenactment was very interesting but IS NOT what the Camden Historic Site is noted for – namely the Revolutionary War Battles that took place nearby in 1780 and 1781. 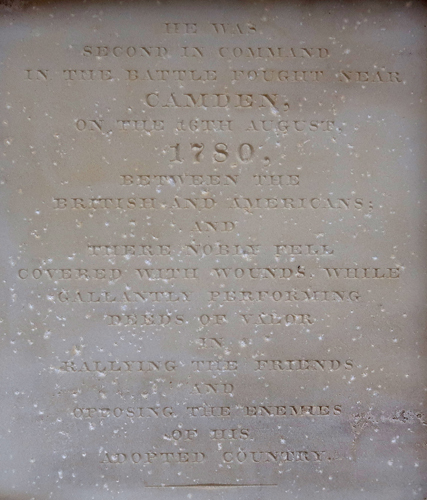 The first battle of Camden took place on August 16, 1780 nine miles north of town. 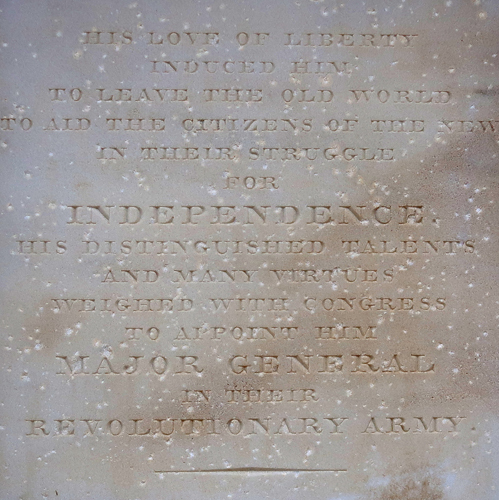 General Horatio Gates was in charge of the American forces and historians blame him for a significant loss to the British. 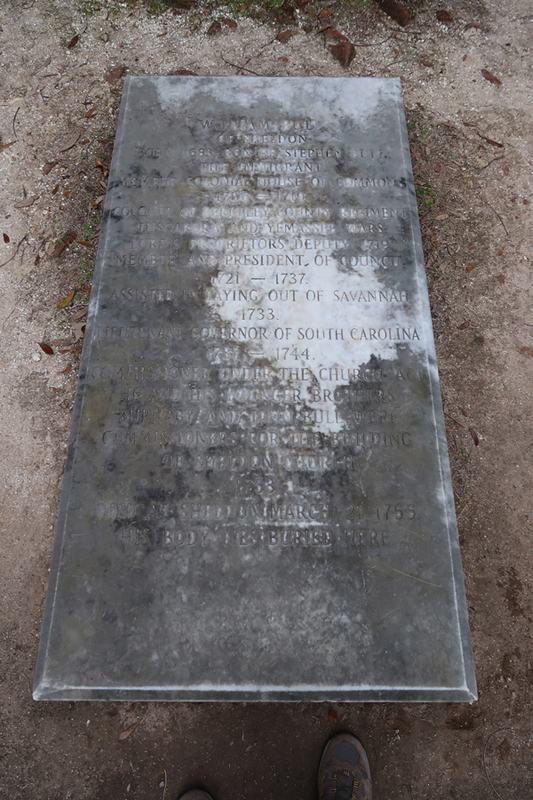 With fewer troops, the British under Lt. General Lord Cornwallis won the battle with far fewer casualties. 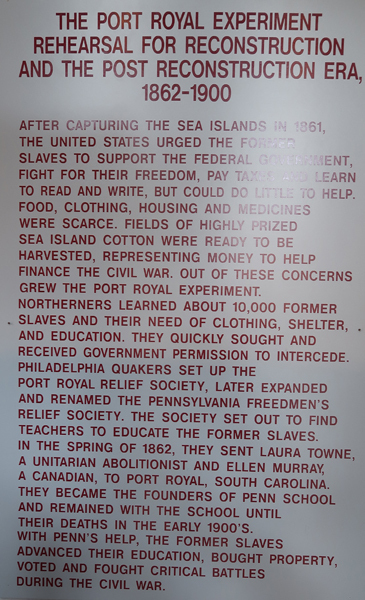 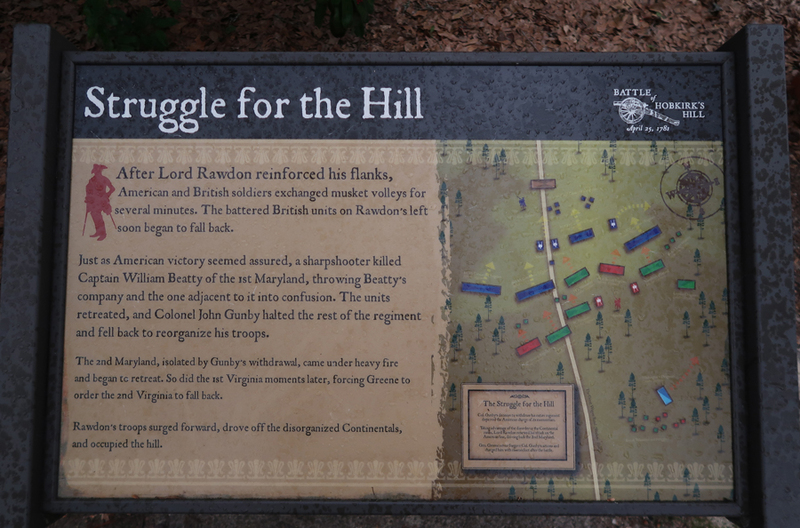 Captured Patriots were held, and some were executed, at the fortified town of Camden. 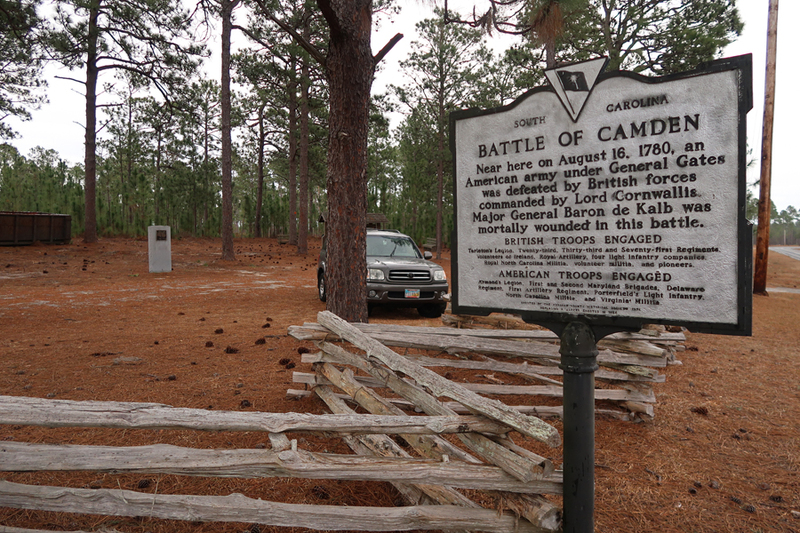 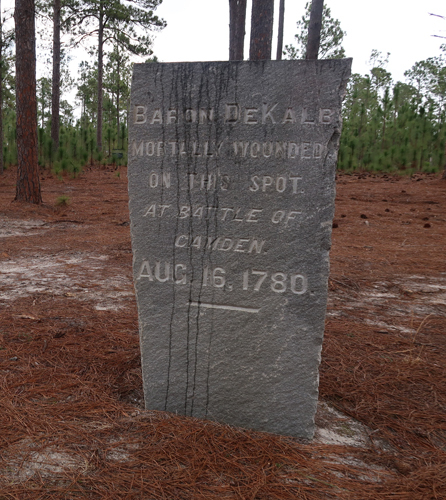 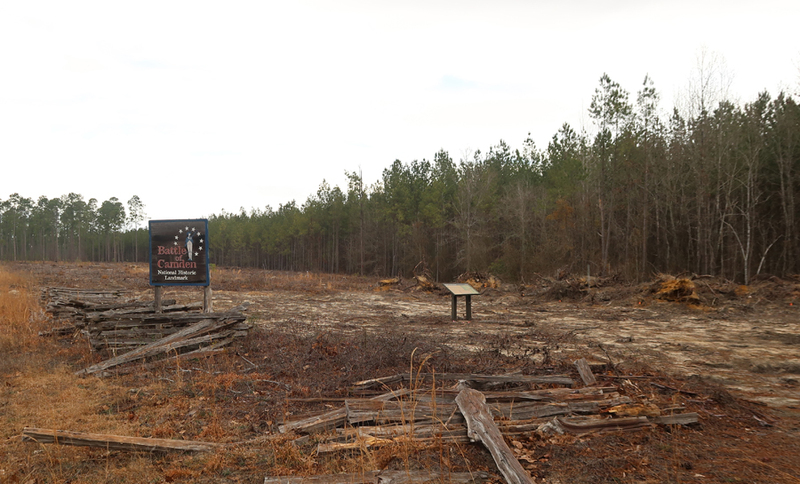 The location is called Camden Battlefield and Longleaf Pine Preserve and is a National Historic Landmark. 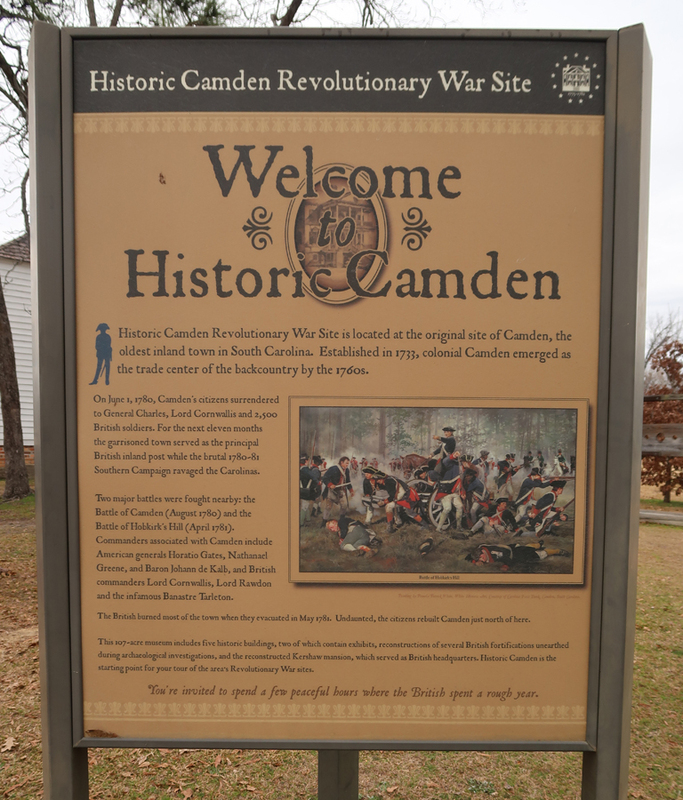 The second Battle of Camden took place April 25, 1781. 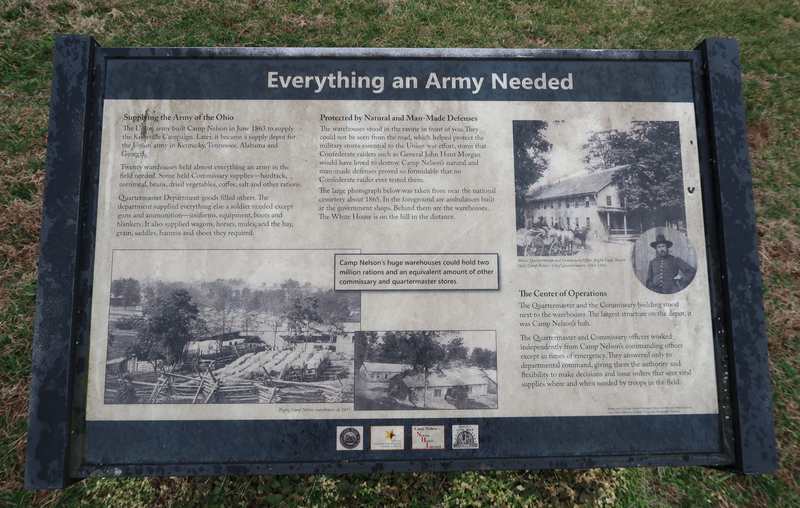 General Nathanael Greene had been put in charge of the Southern Continental Army after Gates’ disastrous defeat the previous year. 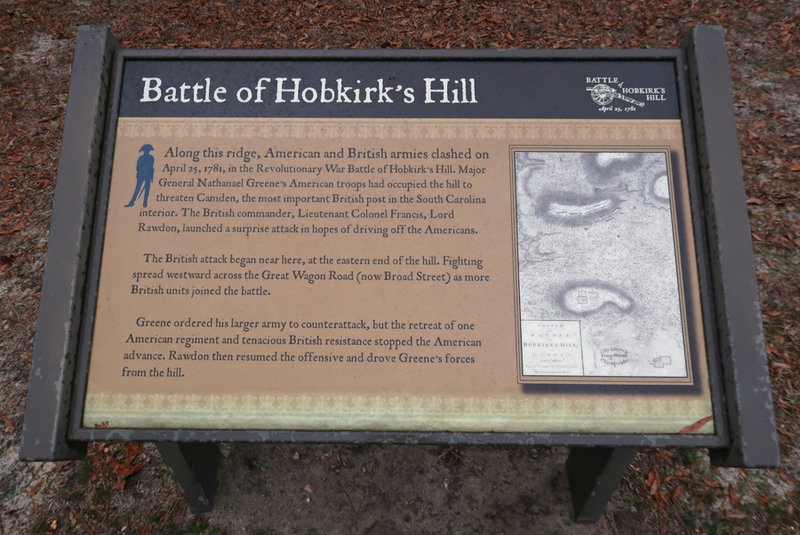 He had a good battle plan – enticing the British to attack him on Hobkirk’s Hill just north of the fortified town of Camden. 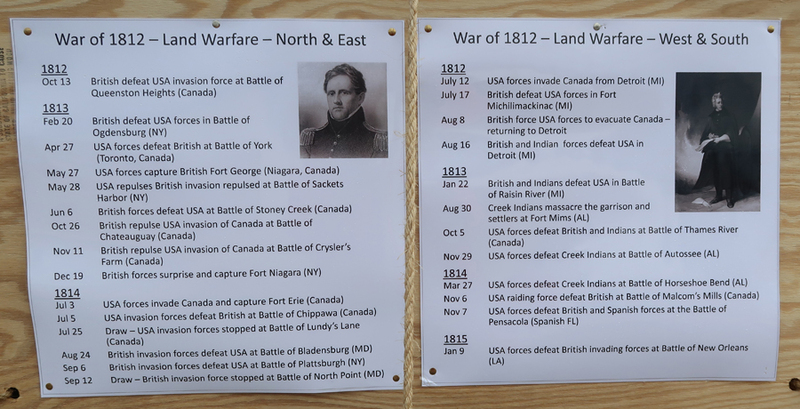 By all accounts this was a fierce battle with similar casualties on both sides; however, the British prevailed. 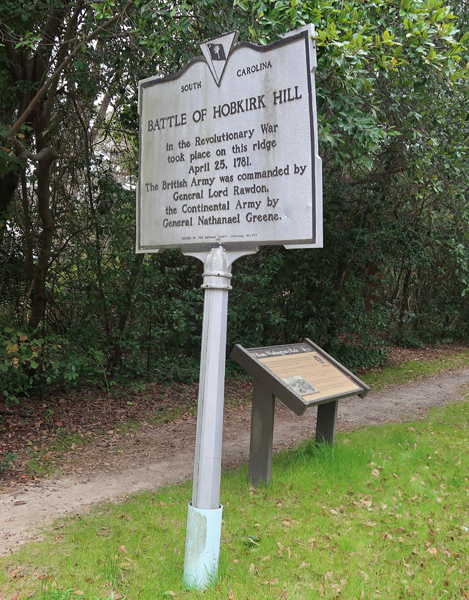 Hobkirk’s Hill is now an upscale part of north Camden. 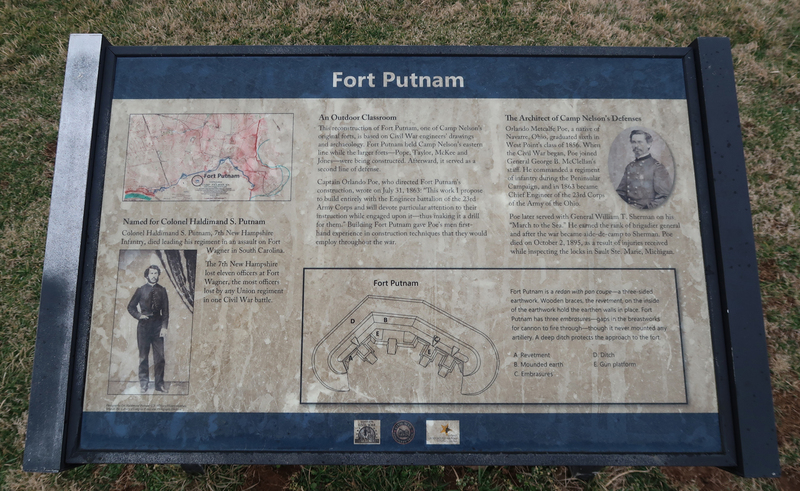 Thaddeus Kosciusko (Polish military engineer) was with Greene and made this map of the fortifications after the battle. 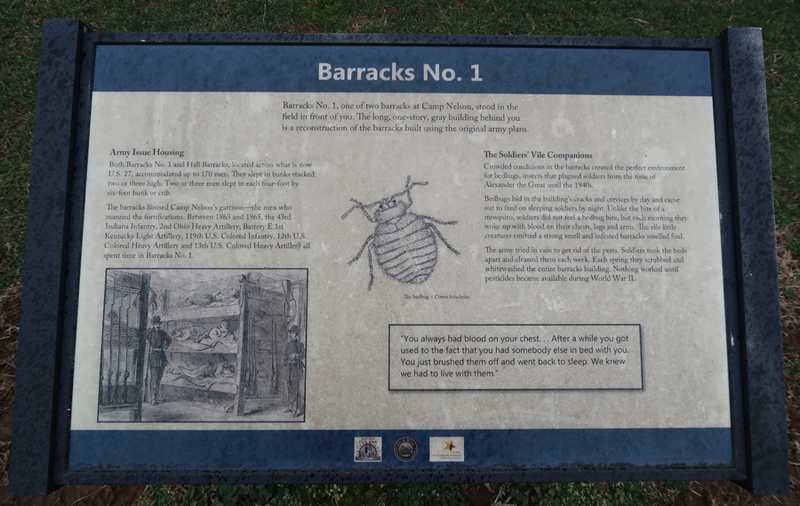 Thaddeus Kosciusko National Memorial is the smallest National Park Unit and is located in Philadelphia (see this Blog August 2016). 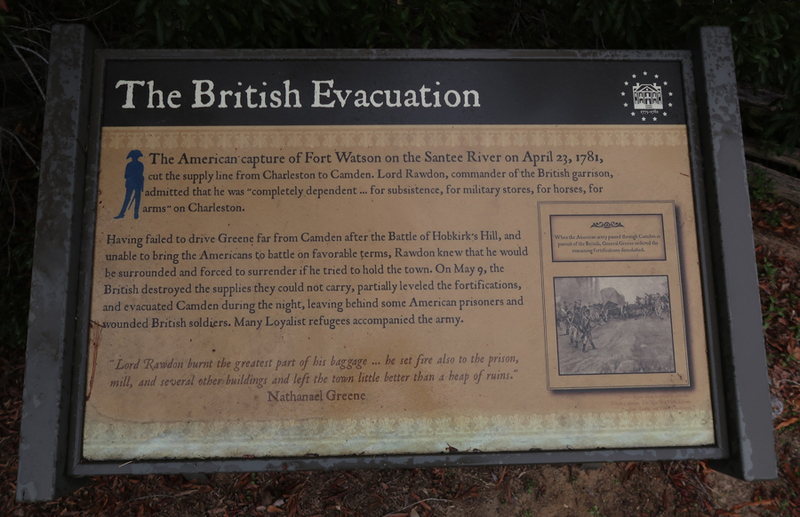 Greene lost the battle; however, his efforts were successful in that the battle forced the depleted British forces to withdraw to Charleston leaving the “backcountry” in American control. 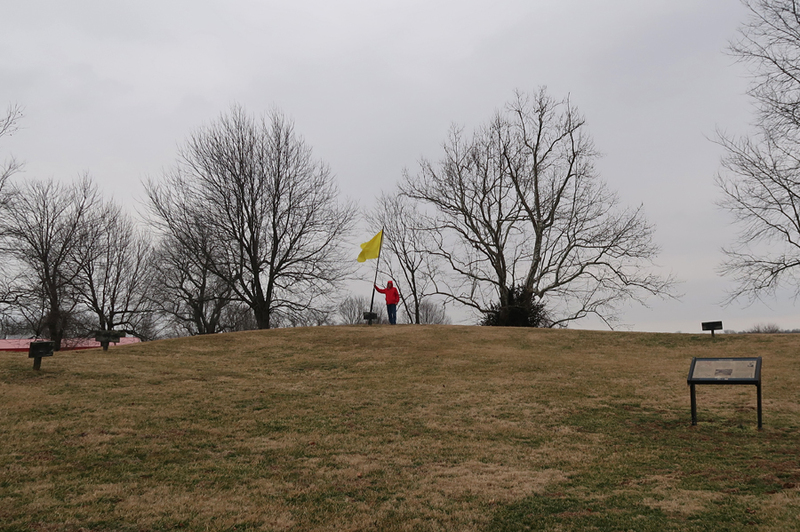 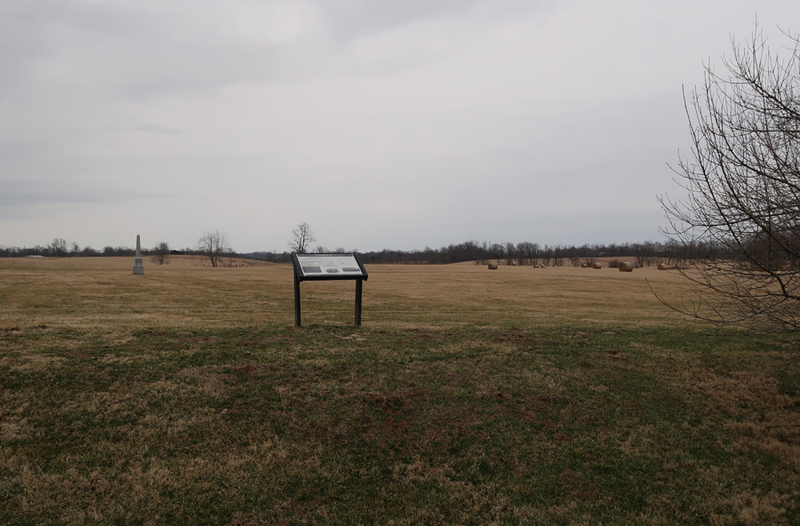 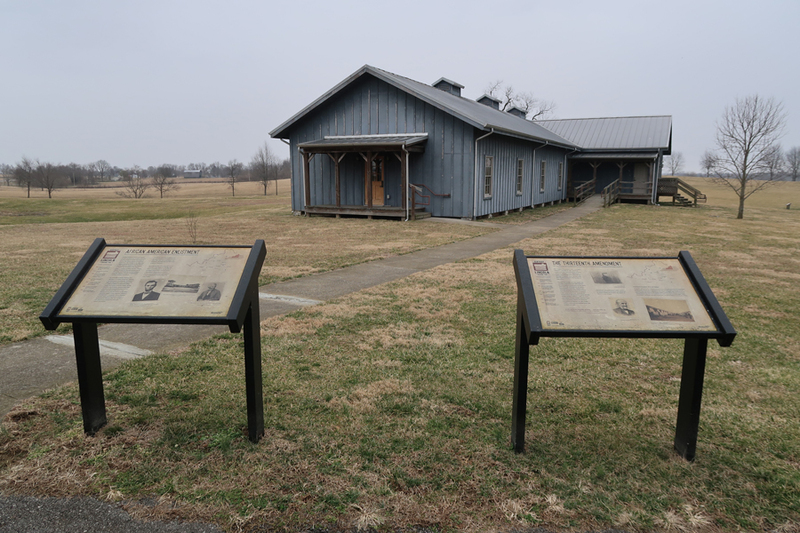 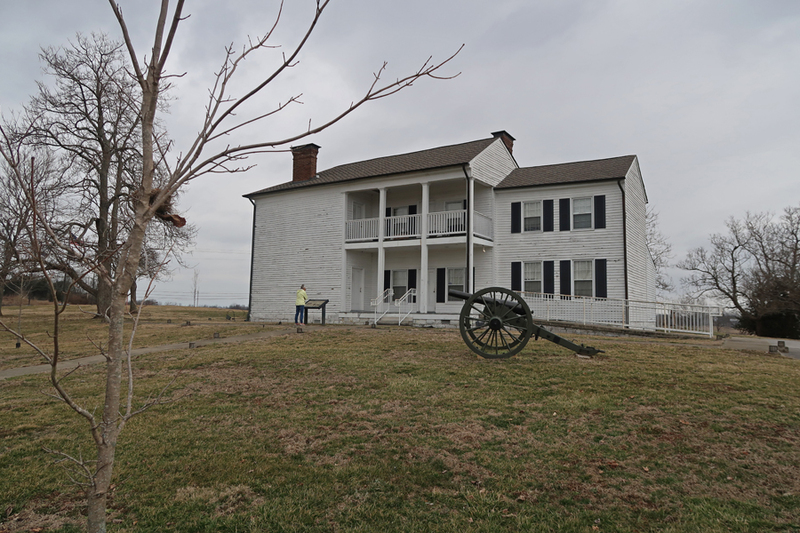 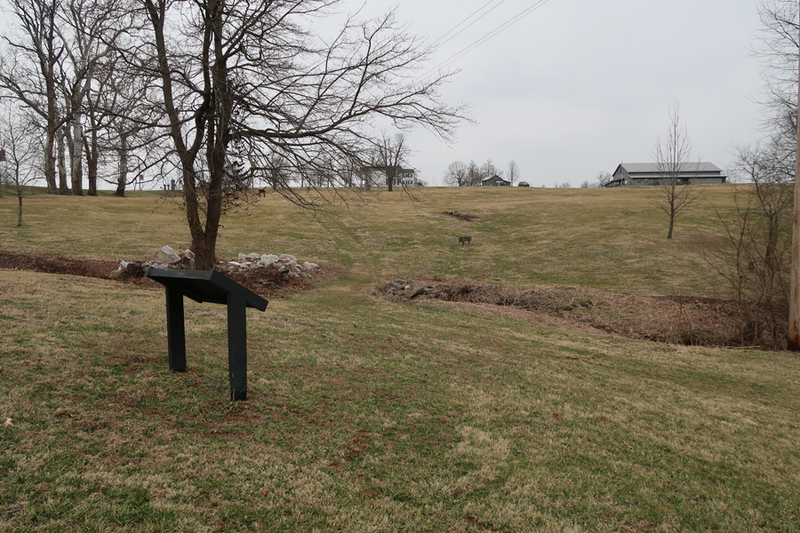 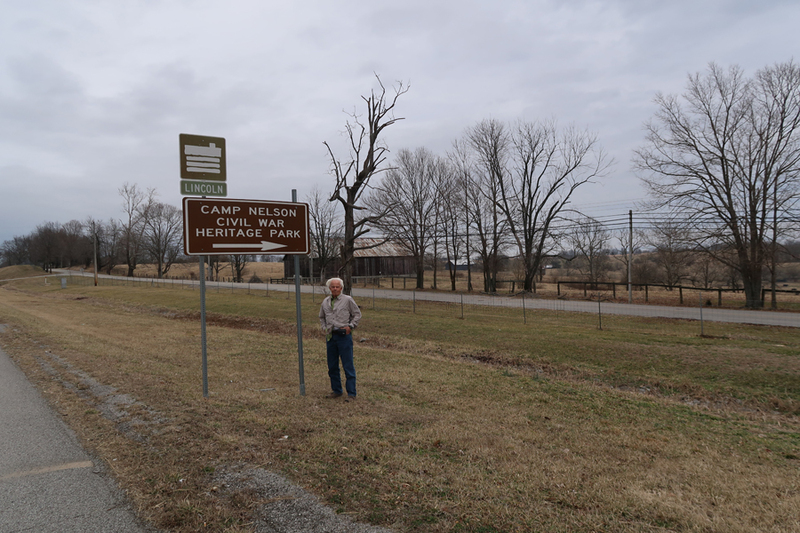 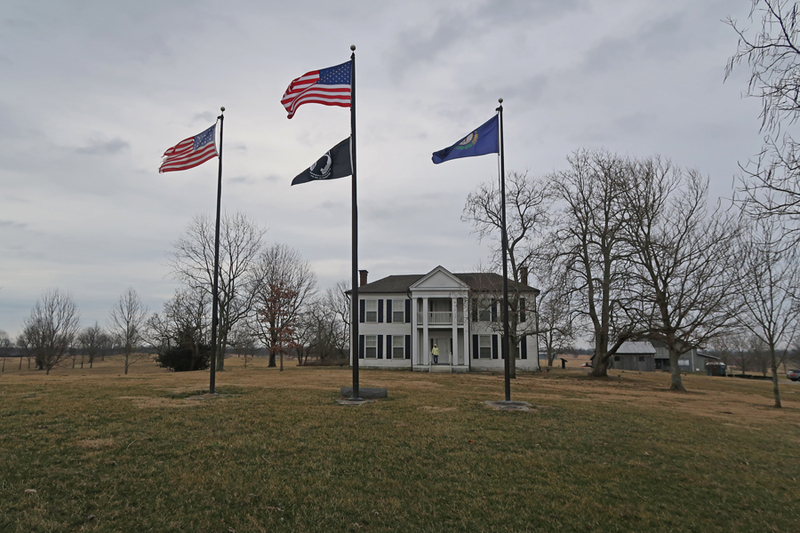 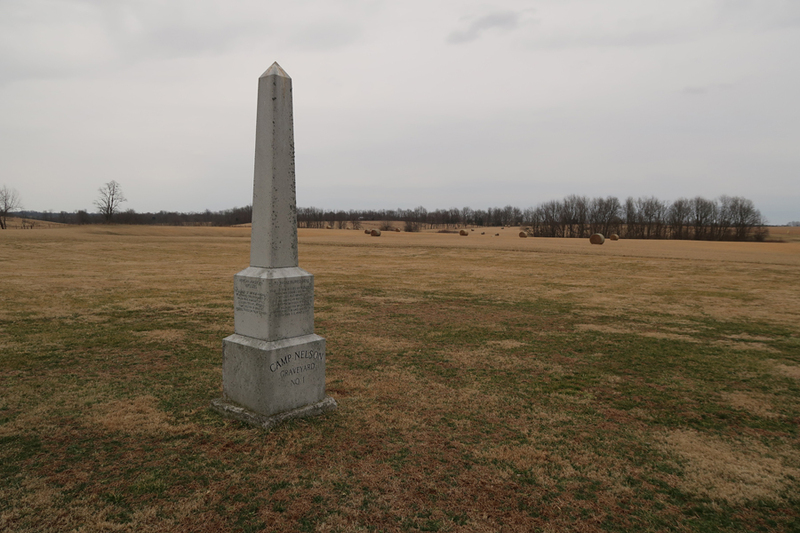 2/4 M – It was a 6hr drive to Camp Nelson National Monument outside of Nicholasville KY. At this time, it is the newest (#418) National Park Unit. 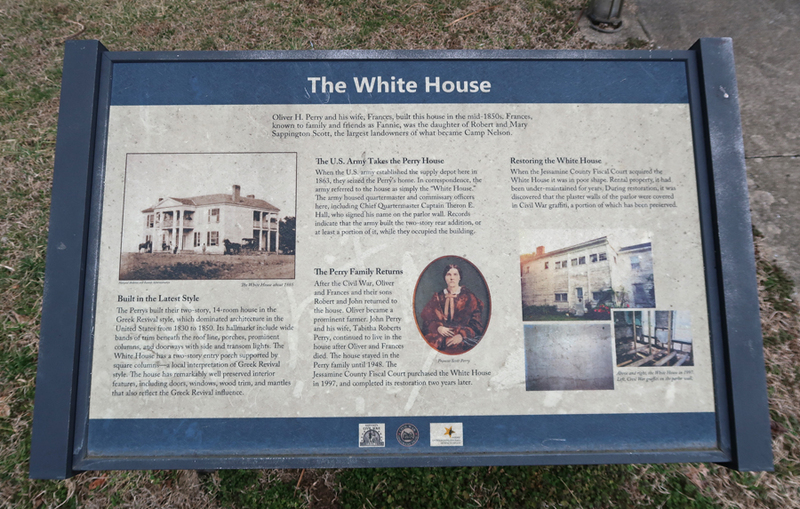 It was designated in 2018. 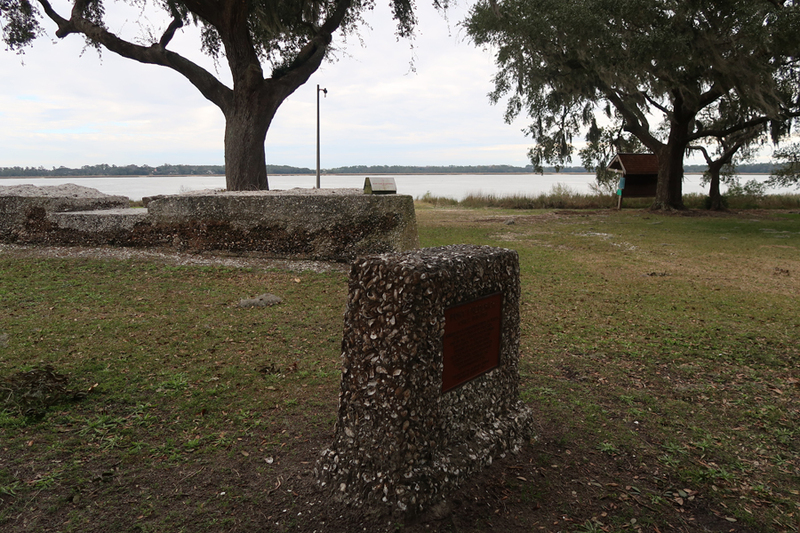 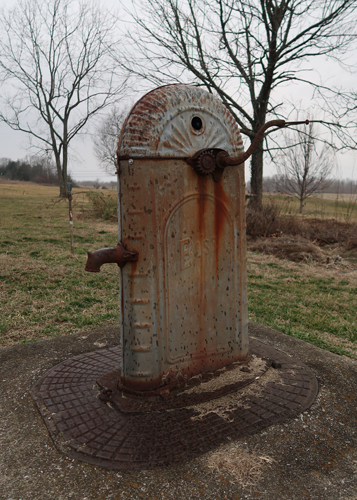 Eight earthen “Fort” batteries were built to protect the 4,000-acre camp. 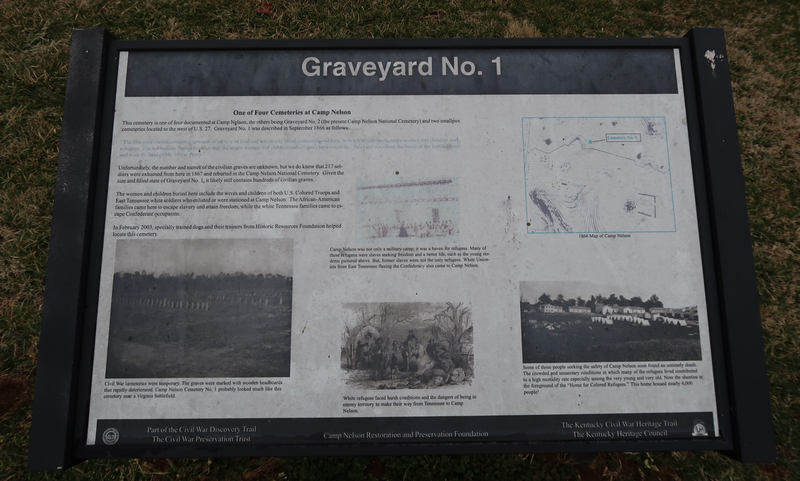 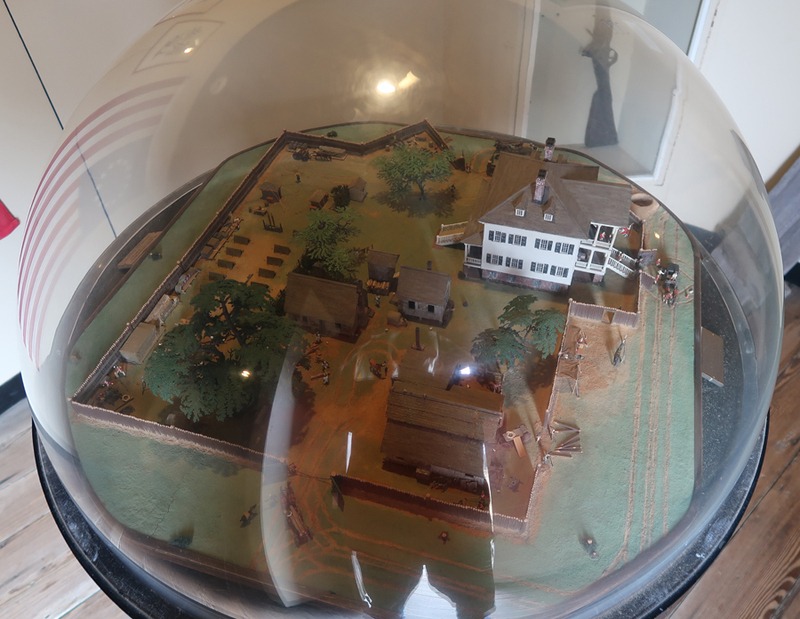 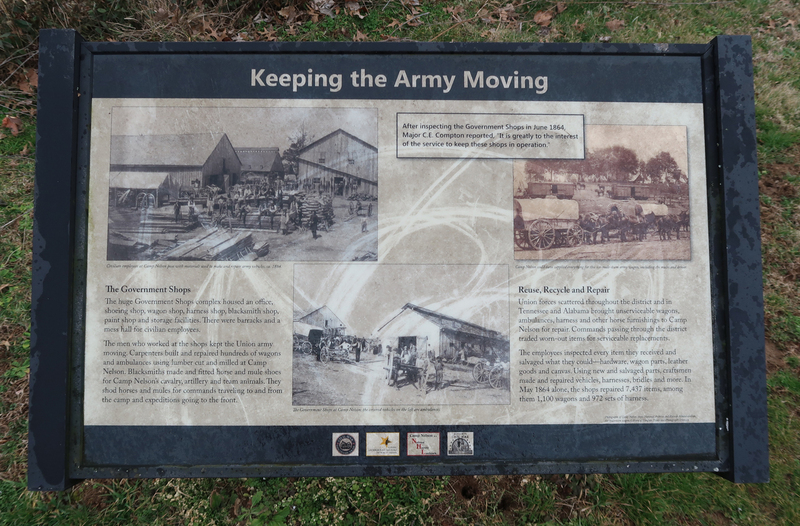 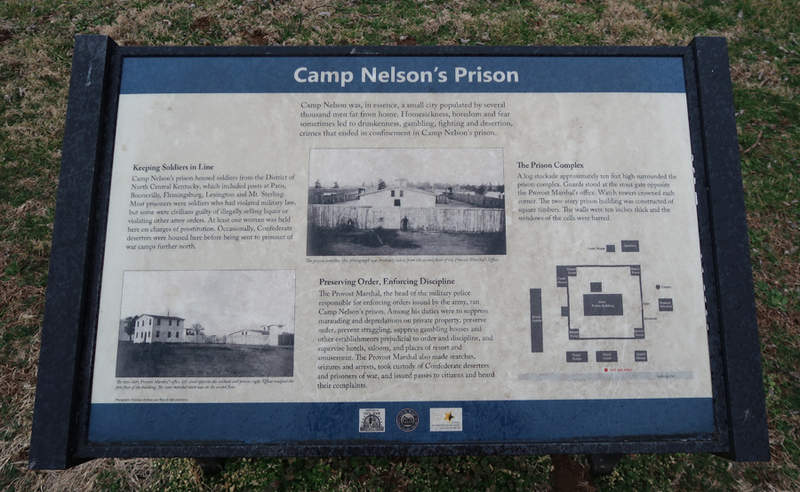 The camp, which was organized around an 800-acre core, included more than 300 buildings and tents that housed a quartermaster commissary depot, ordnance depot, recruitment center, prison, and a hospital. 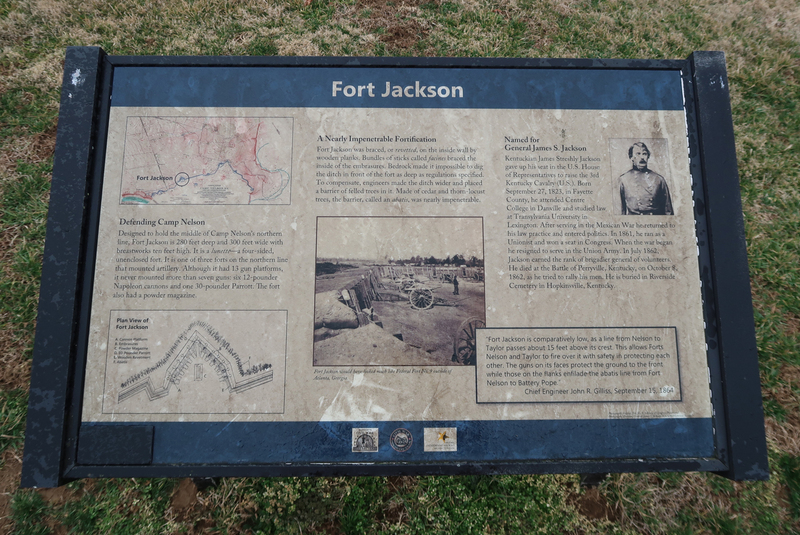 Our first hike was on the 0.5-mile Fort Jackson trail. 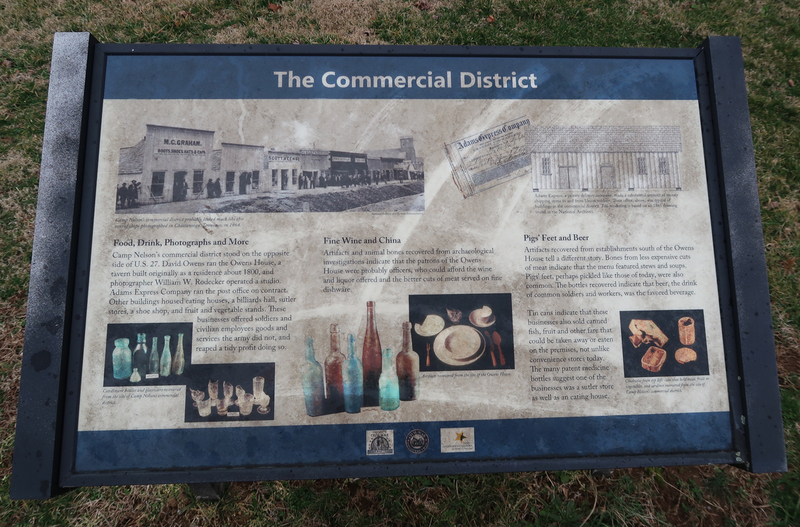 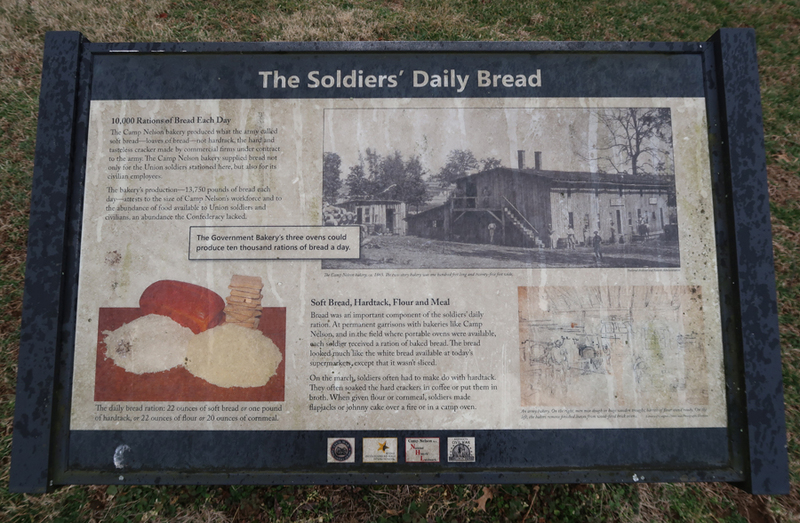 We then did the 0.5-mile Depot trail, which passes by the locations of the prison, bakery, warehouses, government shops, and the commercial district, including the Post Sutler store. 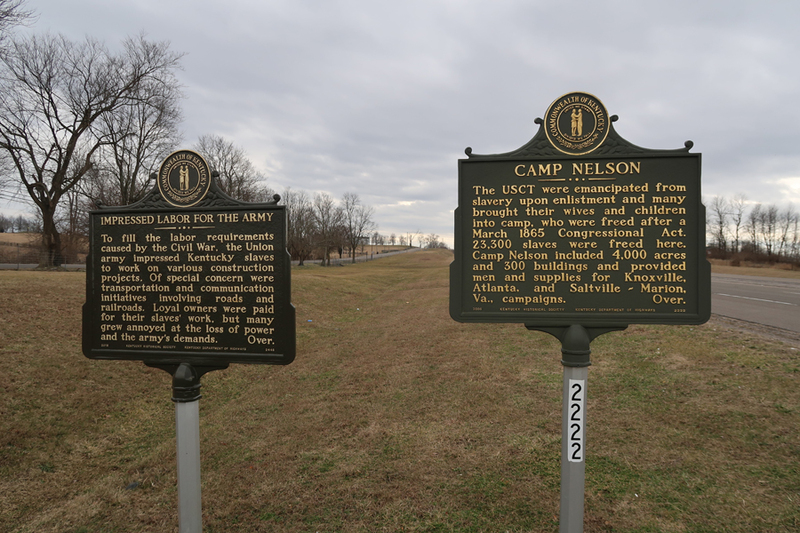 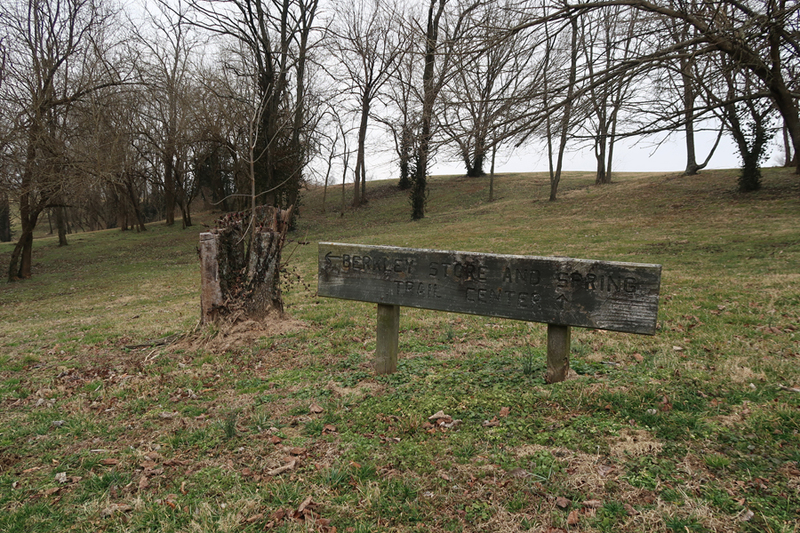 Camp Nelson’s location on the Kentucky River made it a major supply depot during the Civil War. 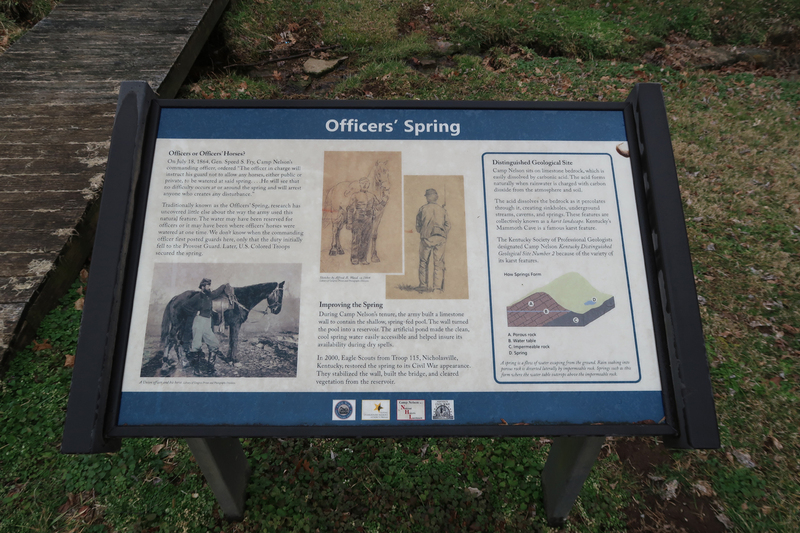 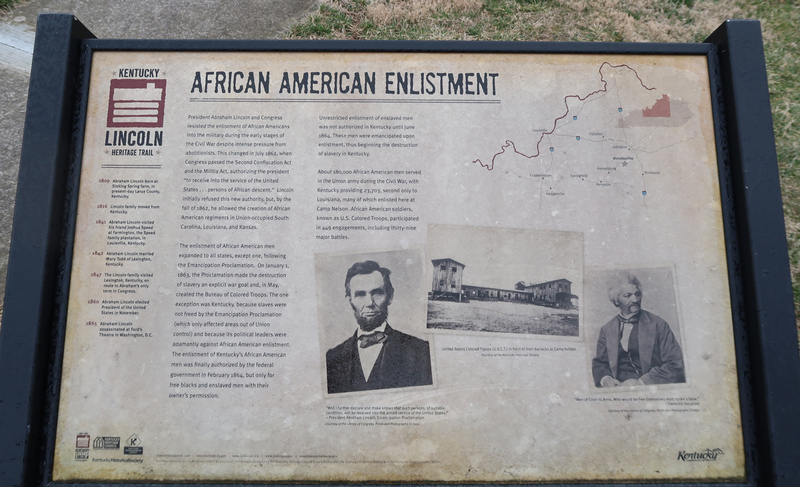 Read the signs to learn about the enlistment of African-Americans and the 13th Amendment. 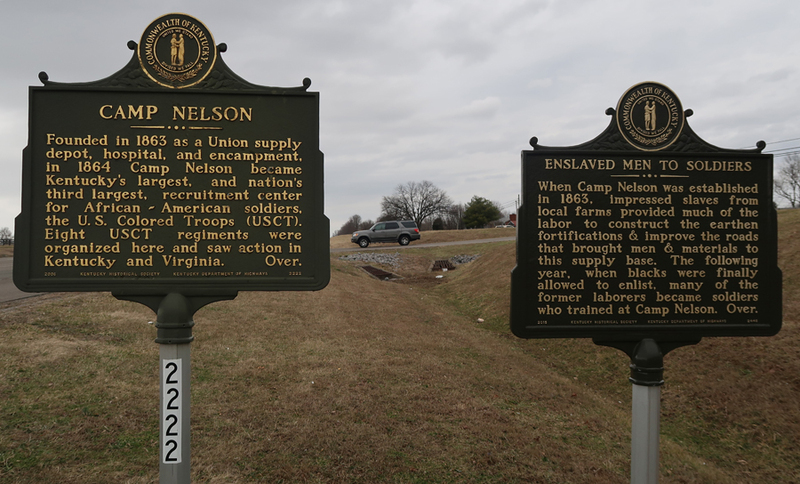 Camp Nelson was one of the Army’s largest enlistment centers for African-American soldiers as well as a refugee camp for African-American civilians. 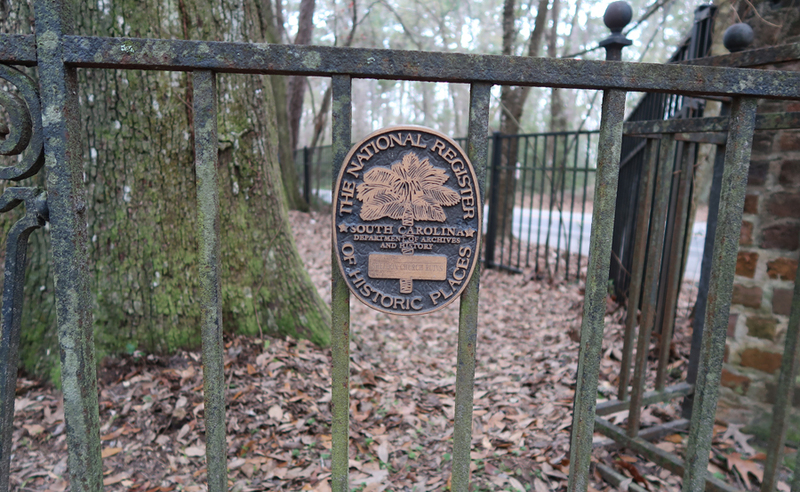 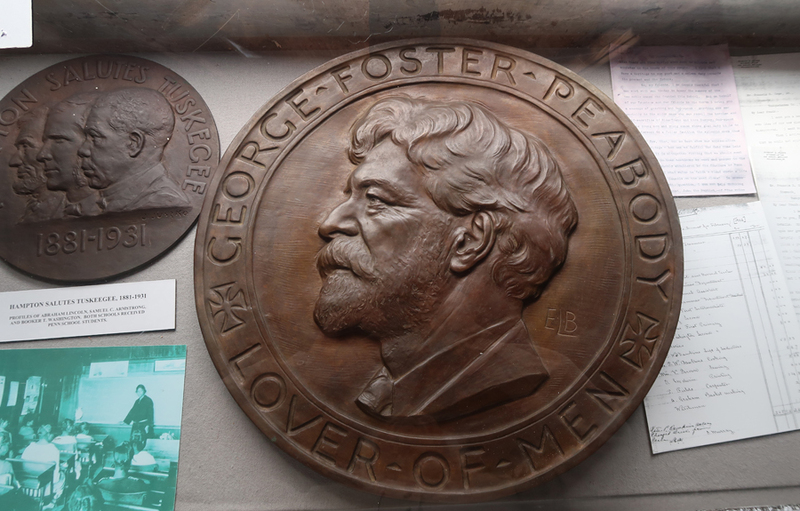 It has been named part of the National Underground Railroad Network. 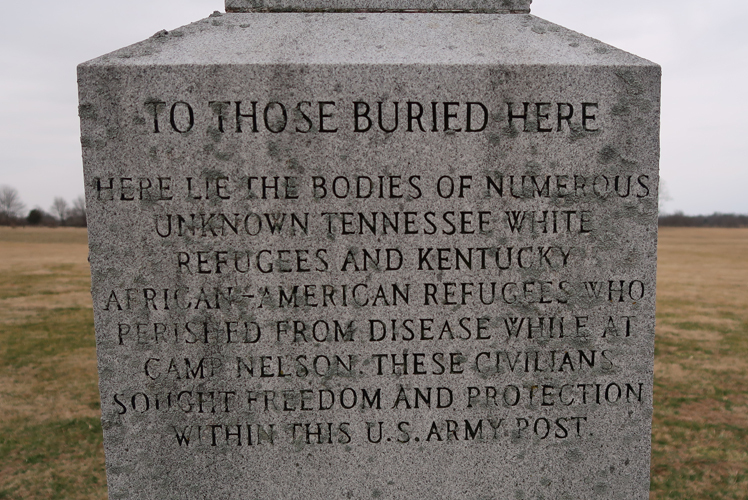 Numerous civilian refugees are buried nearby (Graveyard #1). 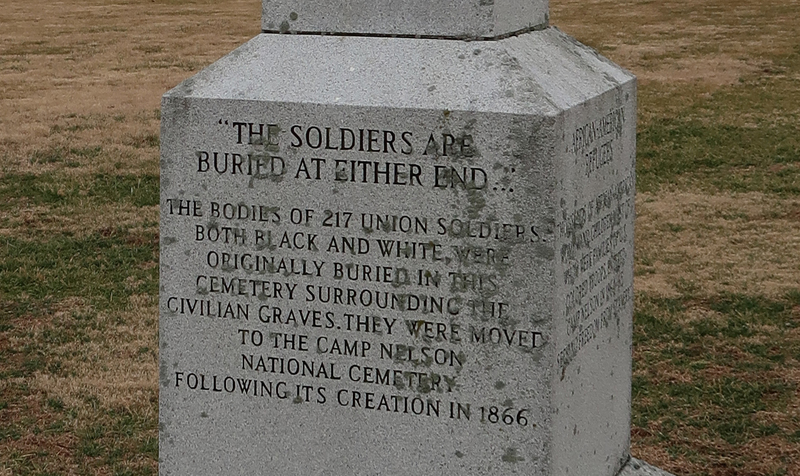 Soldiers that were buried here were re-interned in the adjacent Camp Nelson National Cemetery on the west side of Camp Nelson.